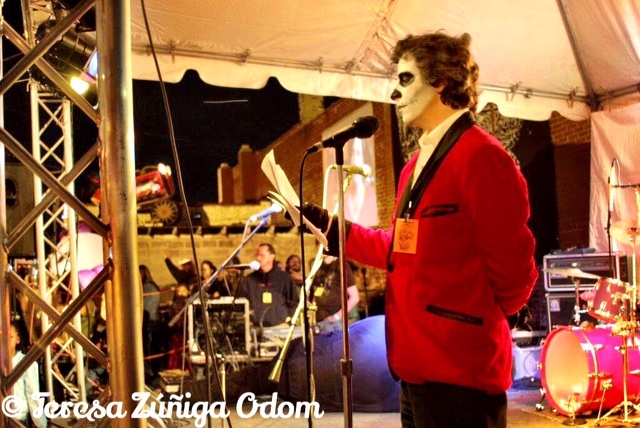 This time each year, I receive a number of “chores for the weekend” emails from the Birmingham Day of the Dead (Día de los Muertos) Festival with great information and lists of ways that volunteers can help each week. Things like puppet painting, sign hand lettering, hang butterflies, work on animal altar, restore old parade umbrellas… I love seeing these emails because it adds to the excitement that DOD is approaching! This little festival has grown into a powerhouse and is in its 12th year. Born the same year as Fiesta Birmingham it is a highlight of the fall for me after Fiesta is over. I get to jump from one colorful event to another and both Latino themed to boot! As I mentioned, DOD started the same year as Fiesta but I have to confess, I didn’t know about its existence until about year 3 when a story hit the Birmingham News entertainment section about the event and why it was created. 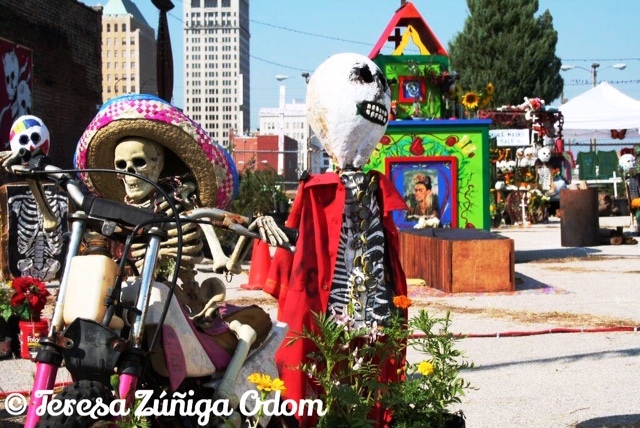 I was intrigued…a Day of the Dead Festival in Birmingham, AL??!! 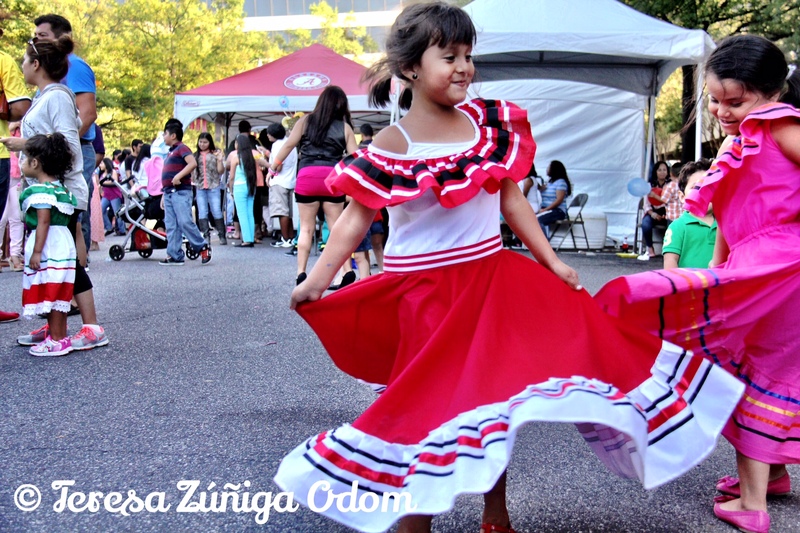 I remember thinking – this is so incredible – and I also remember thinking what an education this festival could provide to our community at large – much like what we were trying to do with Fiesta and the different cultures within the Latino community. 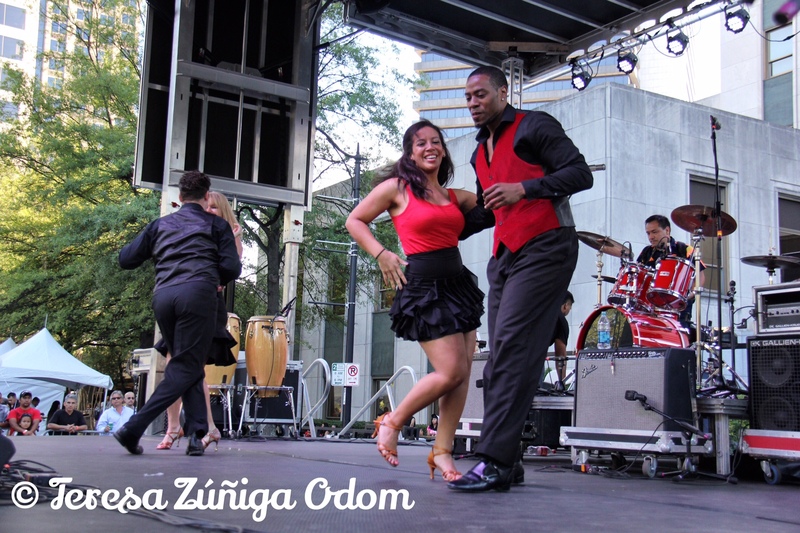 DOD is another aspect to Latino culture that is not quite understood, but this festival is determined to make it understood! 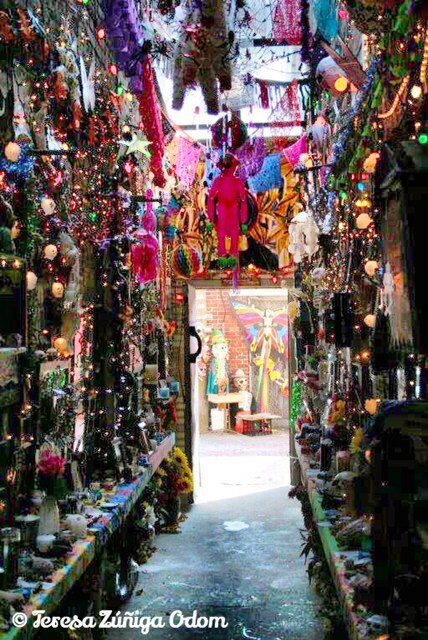 During the early days of the festival, this alley behind the gallery was filled with remembrances and tributes…so much to see and so many touching photos and artifacts. At the time, DOD was housed each year inside and around Bare Hands Gallery in downtown Birmingham. One day at lunch (this was in 2006), I decided I had to go by and meet Wendy Jarvis, the Director of the gallery. Turns out, she had wanted to meet me too so we could discuss our mutual festivals and how we might partner! Don’t you love it when a plan comes together?! 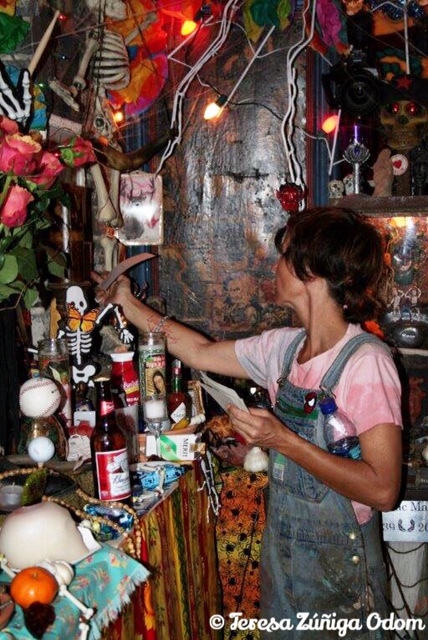 Tracy Martin puts some finishing touches to the Spider Martin altar when it was in the alley behind Bare Hands Gallery. I found out more about DOD and its creation that day. Local artist Tracy Martin wanted to find a way to honor her late father, civil rights photographer James “Spider” Martin, when she and some close friends turned the gallery courtyard into a huge altar and memorial wall. This was in 2002. 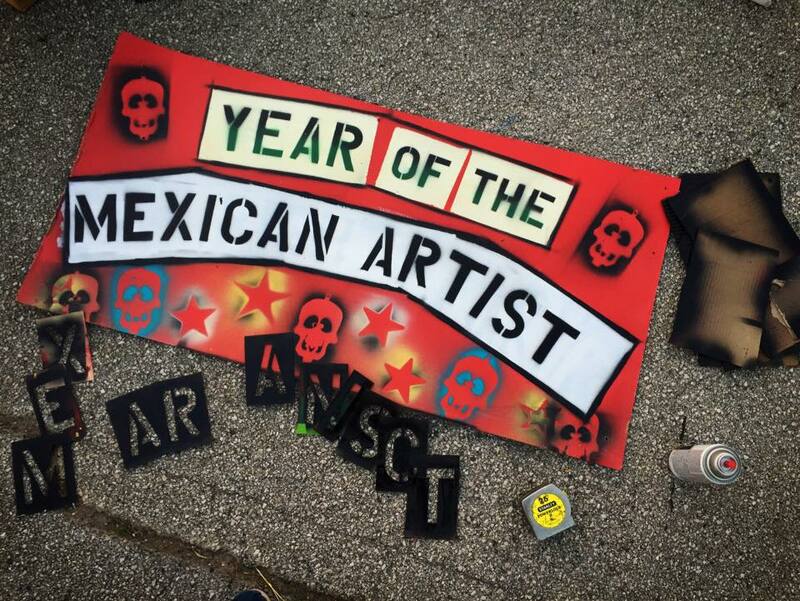 The celebration was expanded – and “born” – the following year and other artists and members of the community were invited to make their own altars and “ofrendas.” Wendy said as the celebration continued each year, she saw it as an opportunity to expand the gallery culturally, especially with the growing Hispanic community in Birmingham. 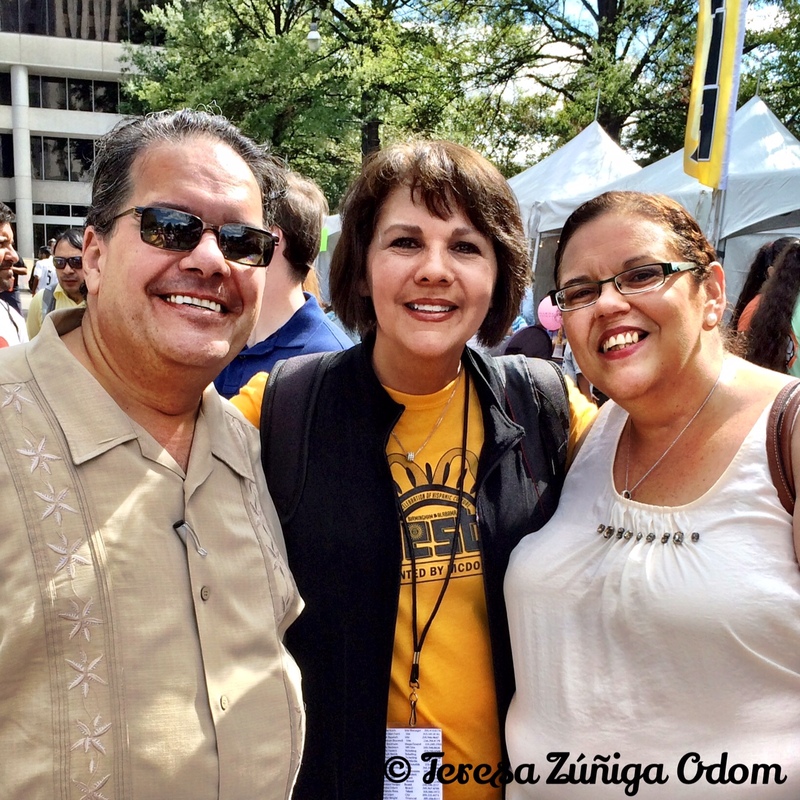 So that year – 2006 – was the year Wendy, Isabel Rubio – Executive Director of the Hispanic Interest Coalition of Alabama (HICA), and I met to discuss how we would partner to bring more Latinos to the event. 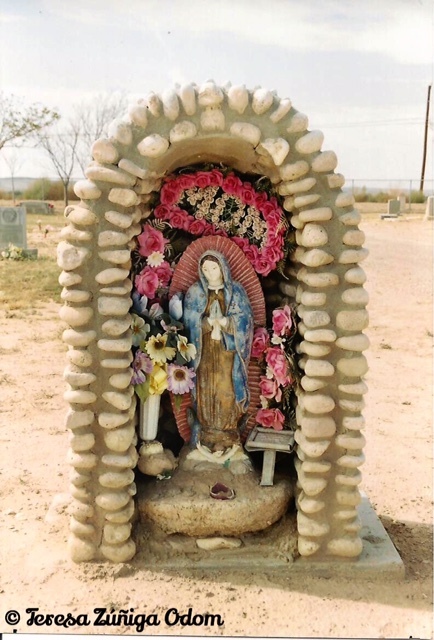 A women’s group from HICA took part in the celebration and built small altars at the event and brought family to celebrate a tradition they would have normally celebrated in Mexico. Since that time, HICA has always had a booth and altar display at DOD and become a true partner of the celebration. 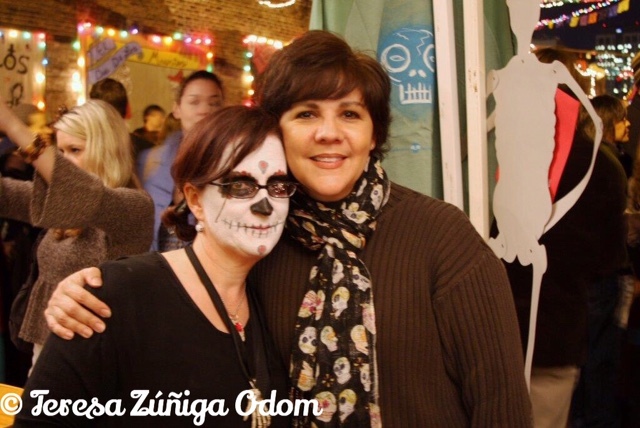 That year, DOD also participated in Fiesta by having a booth in our non-profit village and showcasing some of the art and sugar skulls that would be on display at DOD. 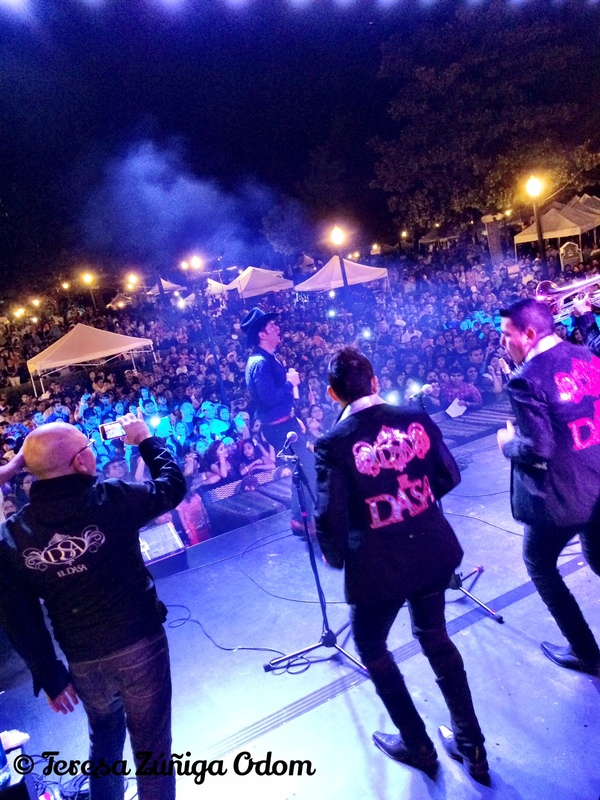 It was a great way for Bare Hands Gallery and DOD to get the word out – in English and Spanish – to Fiesta attendees, reaching a huge cross-section of the community. 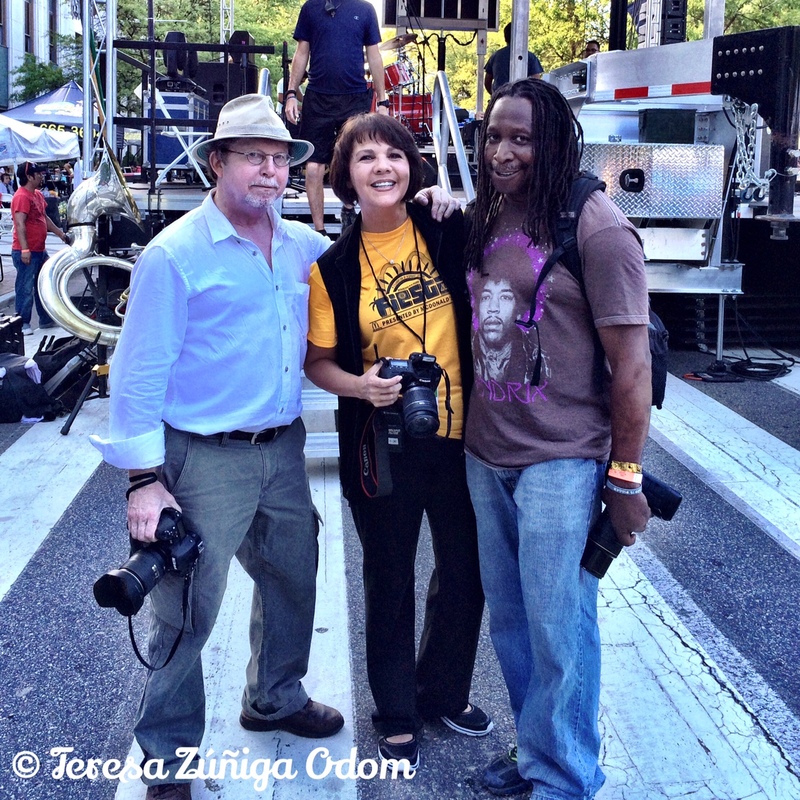 Oh and one more thing…DOD is a photographers dream…you can’t take a bad photograph at this event. The colors, altars, costumes and entertainment are…do I dare say…to die for! Day of the Dead displays behind the gallery. As the event grew this lot behind the gallery became a huge part of the celebration. 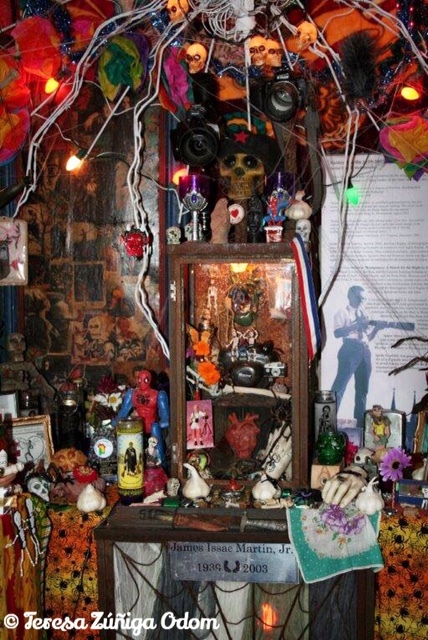 Tracy Martin’s tribute altar to her father, Spider Martin. 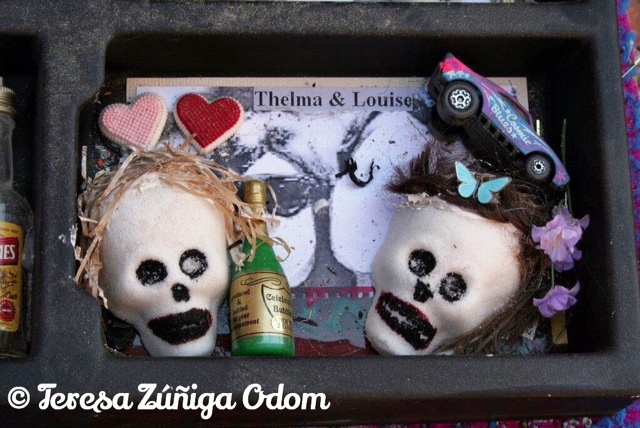 Thelma and Louise sugar skulls! This was part of a huge display of famous couples – one of my favorites! One of the most poignant parts of Day of the Dead is the roll call…people can add the names of their loved ones to be read during the celebration. 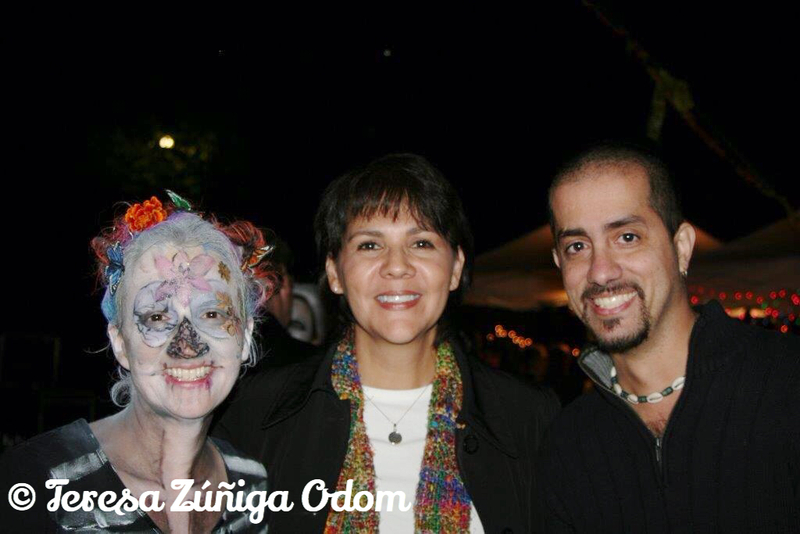 Enjoying one of the festivals with Wendy Jarvis and my dear friend, Lui Fernandez. 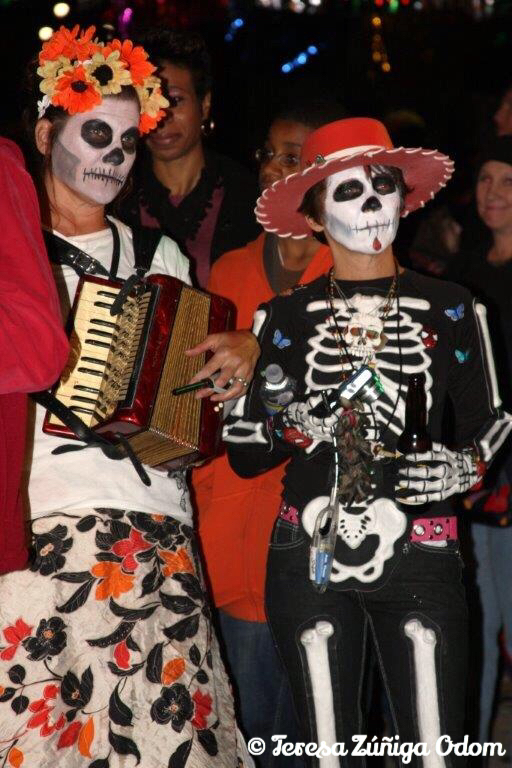 Festival co-founder – Tracy Martin (right) – in one of her many beautiful sugar skull creation costumes. Always love getting a hug from Festival Co-Founder, Wendy Jarvis at each years event. 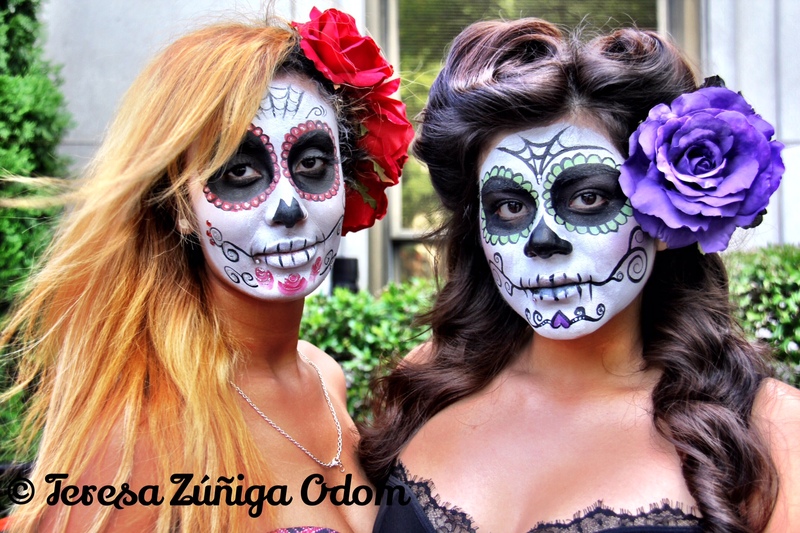 This entry was posted in Birmingham, Day of the Dead, Dia de los Muertos, Festival, HICA, Photography and tagged Bare Hands Gallery, Civil Rights, Culture, DOD Festival, Mexico, Ofrendas, Spider Martin, Sugar Skulls on October 29, 2014 by Southern Señora. The Zuniga cousins – right before heading to the airport – at the end of our New Mexico journey. 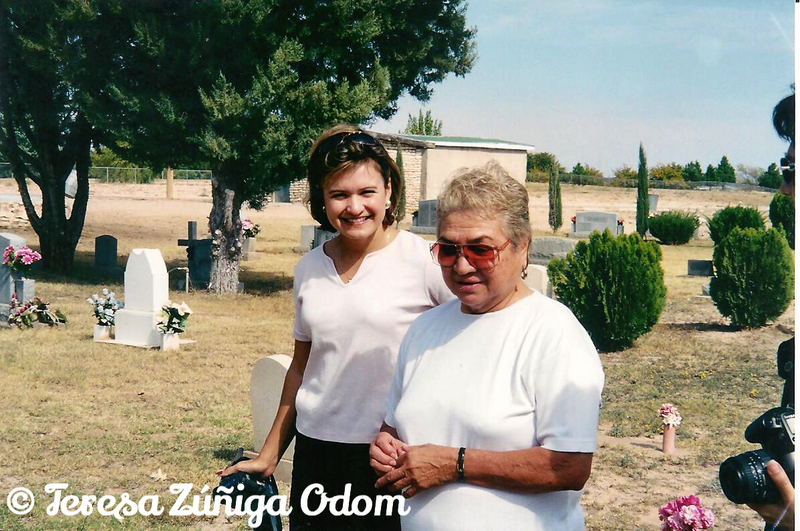 This is Part Three of my pilgrimage to New Mexico after losing my dad in 2001. 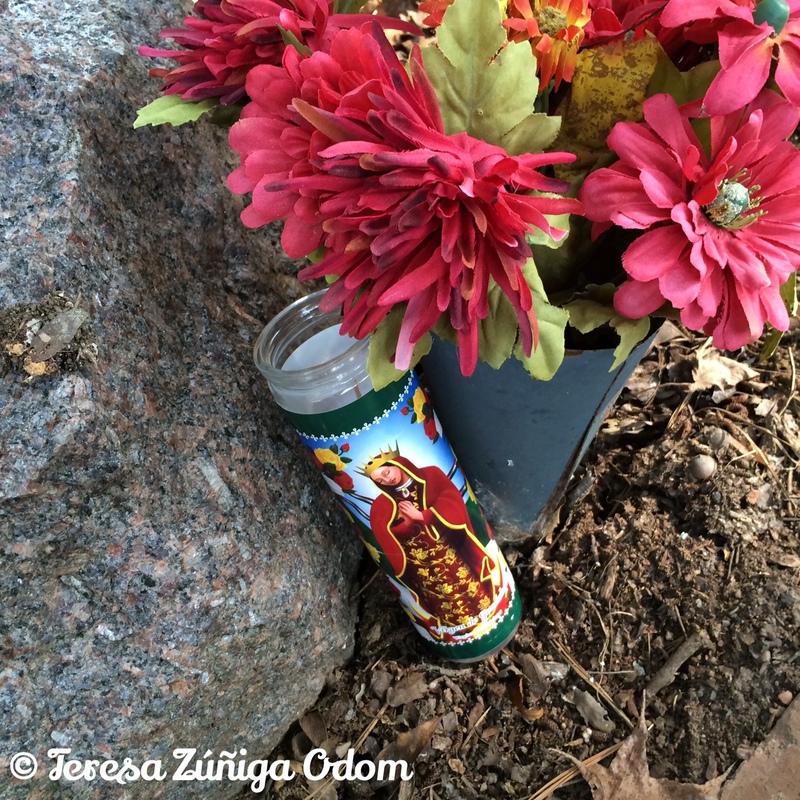 Running into Rachel Fernandez at the cemetery – here with Lisa. We made another trip by the cemetery for more photos and a little more exploration. And who do we run into? Rachel Fernandez! She invited us over for drinks that evening along with her two brothers, Jerry and Dan. 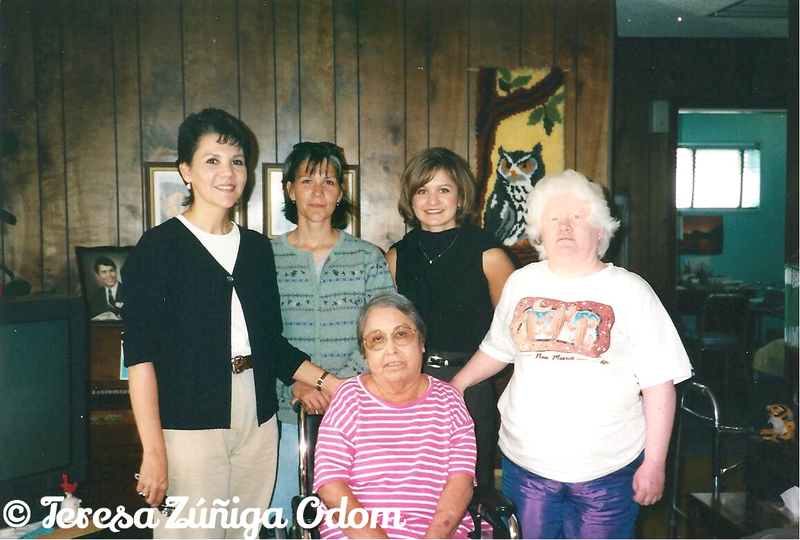 We enjoyed spending more time visiting with Aunt Yoya and Uncle Mando and listening to more family stories. She looked really good that day. We brought out the cake for Uncle Mando, lit the candles, and Yoya held Uncle Mando’s hand and sang “Las Mañanitas” to him – a traditional Mexican birthday song – and as she sang to him, she began to cry….which made us all cry. So touching and so beautiful. Later, Yoya showed us the “Our Town” newspaper with a picture of my dad and his brother Lorenzo (“Lencho”) as altar boys. Such a treasure! We left after sharing cake and promised to come by again before returning to Albuquerque. Then it was on to Vone and Raymond’s house for a feast of carne asado, tortillas de maiz (corn tortillas), beans, rice, potatoes and a great salsa. And always the conversation turned to food and family! Then it was on to Olivia’s for a short visit with her and her girls. Lisa posing with Rachel in her chili pepper kitchen! The last stop on our whirlwind day was to Rachel’s apartment for drinks where we met her brothers Jerry and Dan. More cousins! We talked a LOT about food, especially tamales and Rachel remarked about how she was late in getting the tamale making started for the holidays. Her entire apartment was decorated in red and black, thanks to her brother Bobby. He definitely had an eye for décor and celebrating and would always help her with her Christmas decorating every year. Upon leaving, Dan and Jerry invited us to their house for breakfast. An offer we couldn’t refuse! 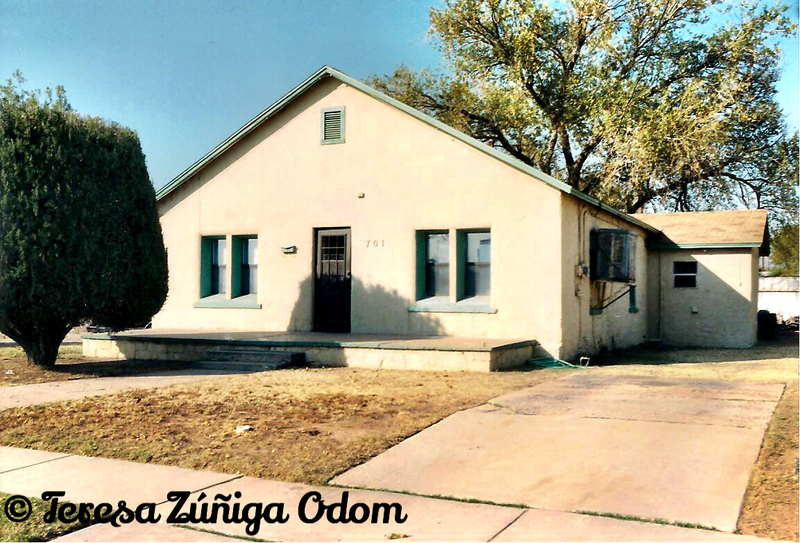 Tia Maria’s house – now the home of her grandsons – Dan and Jerry Fernandez. One last visit with Aunt Yoya and Cousin Rosie in Carlsbad. 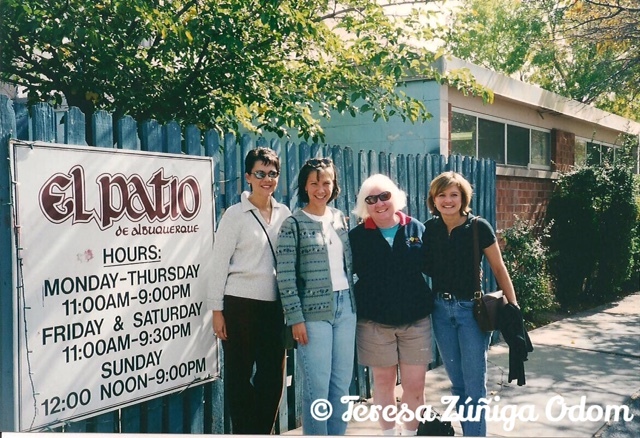 Back in Albuquerque, we had to go by Old Town for a little shopping before heading back to Danda’s house for yet another fabulous meal – tortilla soup and stir fry vegetables! More stories and we especially loved hearing about how Danda learned to cook from our grandfather, Tata Polo! She learned by watching him and so many of her incredible recipes are from our grandfather. 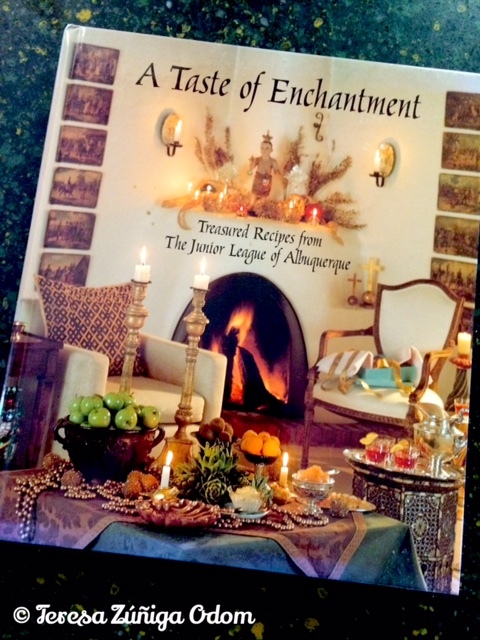 At the end of the evening, Danda gave us each a recipe book from Albuquerque with a sweet inscription. We finished out the evening looking through a box of old photos with Danda promising to make copies and send to us. Tuesday, Oct 30, was our last day. Danda prepared a breakfast of scrambled eggs mixed with tortilla chips. I haven’t tried this at home but my sister has and cannot get the same result! 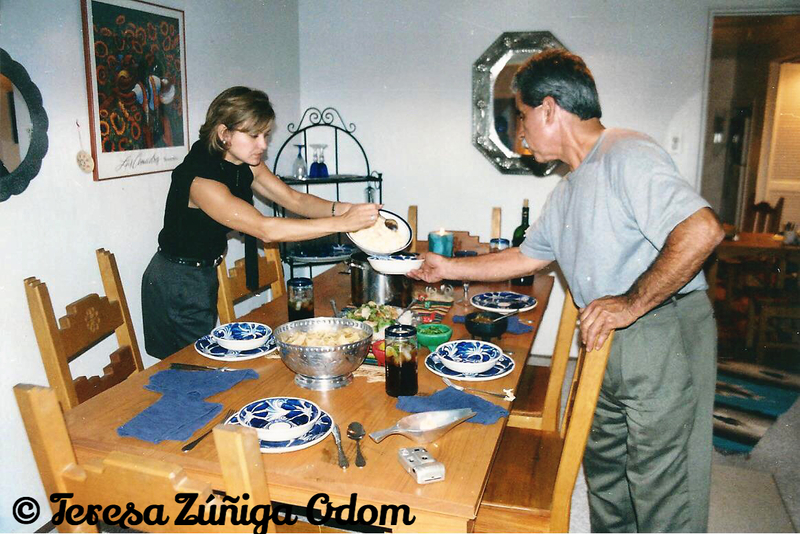 She also prepared caldio – a mixture of ground beef, onion and chiles. What a treat!We were also thrilled to have a little more time to visit with Bobby Fernandez…he stopped by to say good-bye and we took the opportunity to get a few photos with him. On our way to the airport, we stopped by Danda’s school to visit and see her in action. We ended our trip together – cousins – at the airport – chatting and enjoying food – a cup of posole…and then heading to our separate planes and back to our lives. This trip gave us the opportunity to walk where our father’s had actually walked, visit the places they had known as children growing up and reconnect with family we hadn’t seen in years or didn’t know at all. I know we all felt closer to our dads as we boarded our planes. 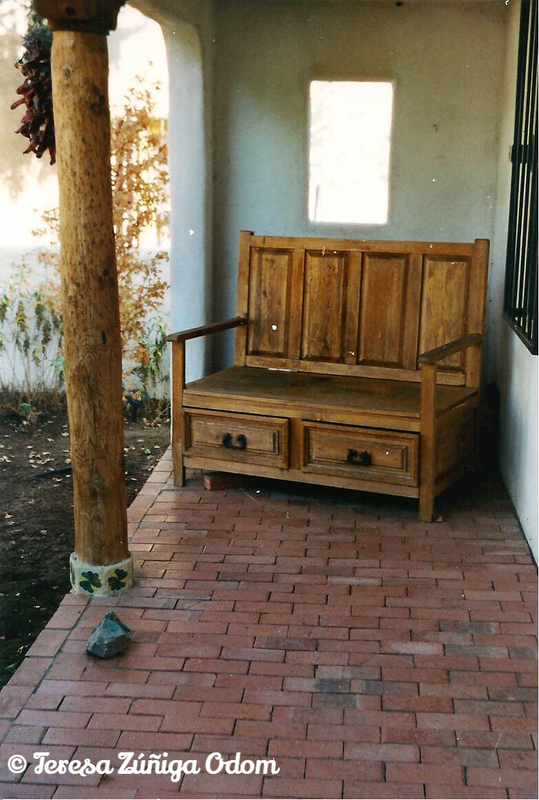 Danda’s front porch – I loved this bench when I saw it and a few years later my husband found one in Birmingham and bought it for me! 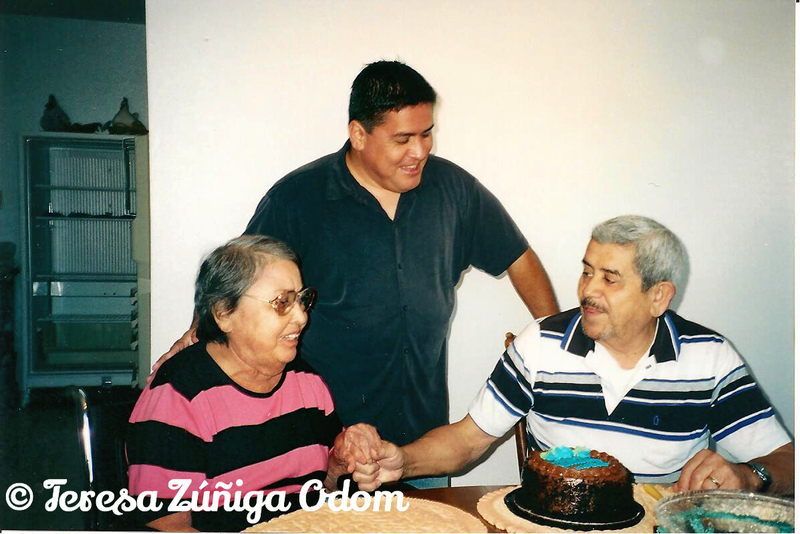 This entry was posted in Albuquerque, Carlsbad, Cousins, Familia, New Mexico, Photo Vault, Uncategorized and tagged Aunt Yoya, Cemetery, Cookbook, Cousins, Family, Food, Pilgrimage, Uncle Mando on October 28, 2014 by Southern Señora. 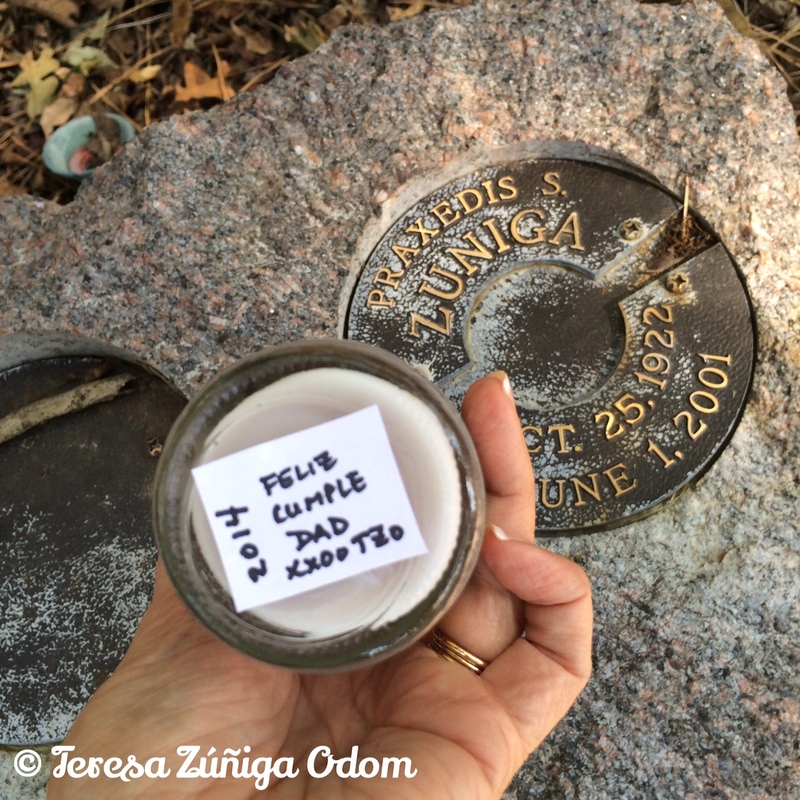 Part Two of Feliz Cumpleaños Dad…my pilgrimage trip to New Mexico in honor of my dad. We awoke on Friday, Oct 26, to the heavenly smell of coffee!!! Thank you Danda! Much needed after the wonderful and late night of reconnecting, food and drink. 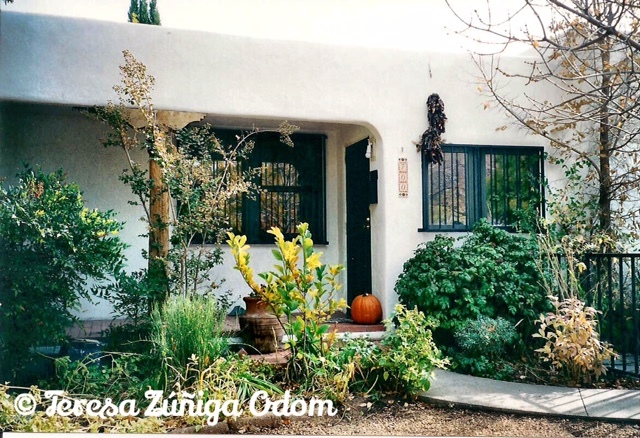 After Danda headed to work, we got ourselves ready, packed up the car and headed to El Patio Restaurant for a breakfast of huevos rancheros and green chiles! I think it goes without saying that the food on this trip was fabulous! After dropping Cecilia off at her house, we were on the road to Carlsbad! It’s about a four and a half hour drive and we enjoyed every minute of it, catching up and sharing even more stories. 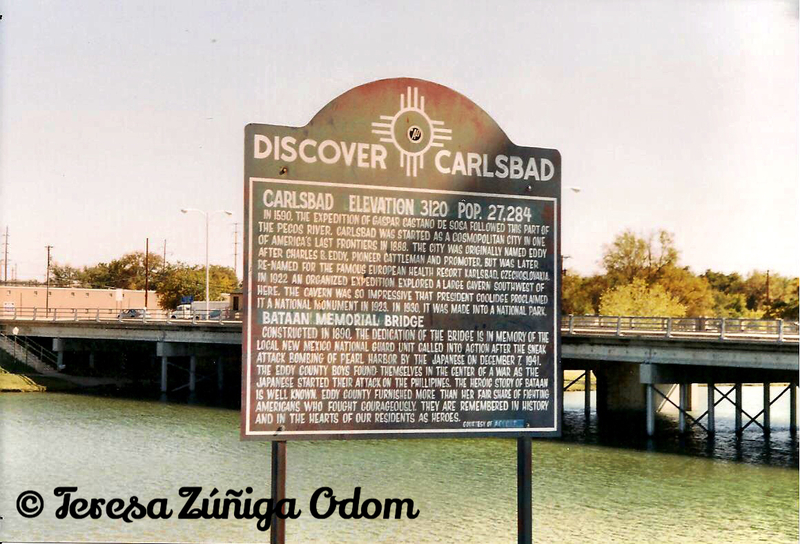 We made a brief stop in Roswell to check out the extraterrestrials and arrived in Carlsbad late in the afternoon, checked into the Holiday Inn and headed directly over to Aunt Gloria’s house (also called Aunt Yoya). We didn’t stay too long because she needed rest but we were able to sit with her in her bedroom for a while. We then spent a little time with Uncle Mando and two of their children, Orlando and Rosie. Sweet photo of Aunt Yoya and Uncle Mando on our second day in Carlsbad. On Saturday (Oct 27), we went back to Aunt Yoya’s house for a longer visit and she was able to stay up a lot longer! Maybe it was the excitement of having us there and all the stories she wanted to share that helped. It was certainly a thrill for us as we looked through her wedding album. We also got to meet Alfonso and Mary Noriega. Mary, Aunt Yoya and Lisa’s mom, Mela were all friends…Mary remarked how much she saw of Mela in Lisa’s face. After our visit we took a tour of Carlsbad with our fearless guide, Lisa! She drove us by the Main Street house where our grandparents used to live, drove by an area they called the beach, and Lisa pointed out other interesting sights to us as she recalled Carlsbad as a little girl. She even took us on the “weee” – a small hill in the road that always made them want to say “weee.! That was such a sweet memory and now Kanista and I were in on it too! We lunched at a little place called Lucy’s and where a woman walked by and recognized Lisa. It was Rachel, cousin Bobby Fernandez’s sister! Bobby had called to tell her we would be in Carlsbad so she must have been on the lookout for us. From there we went by to see Olivia, Lisa’s late brother Ruby’s wife. 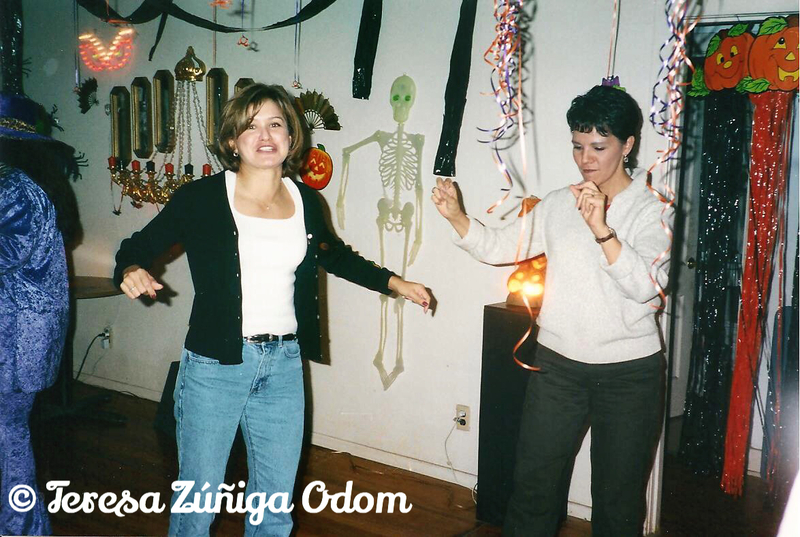 Her daughter Sylvia – “Syba” – was getting ready for her birthday Halloween party and invited us to come back that evening. 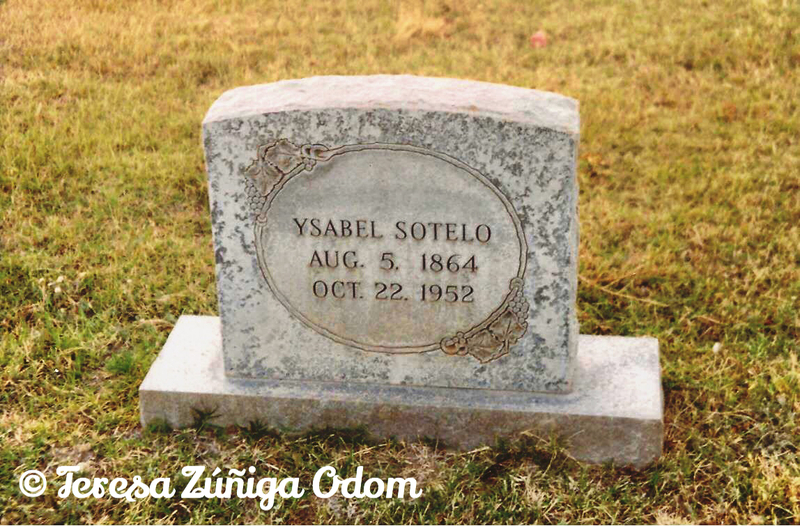 Our grandparent’s headstone in the older Carlsbad cemetery…Apolonio Guerrero and Norberta Sotelo aka Tata Polo and Nana Beta. Meanwhile, we decided to head over to the cemetery to find our grandparents headstone. 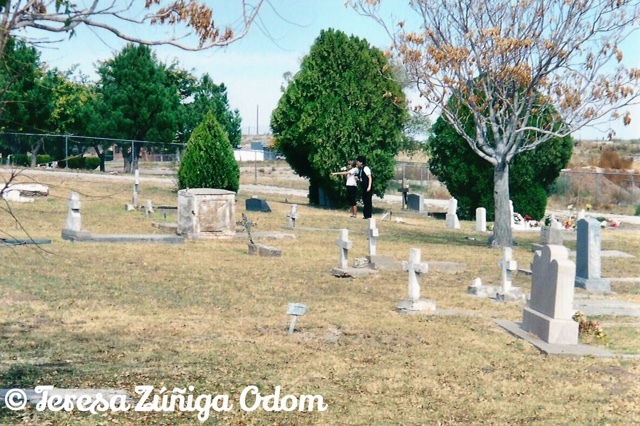 After much searching, we realized we were in the wrong cemetery! 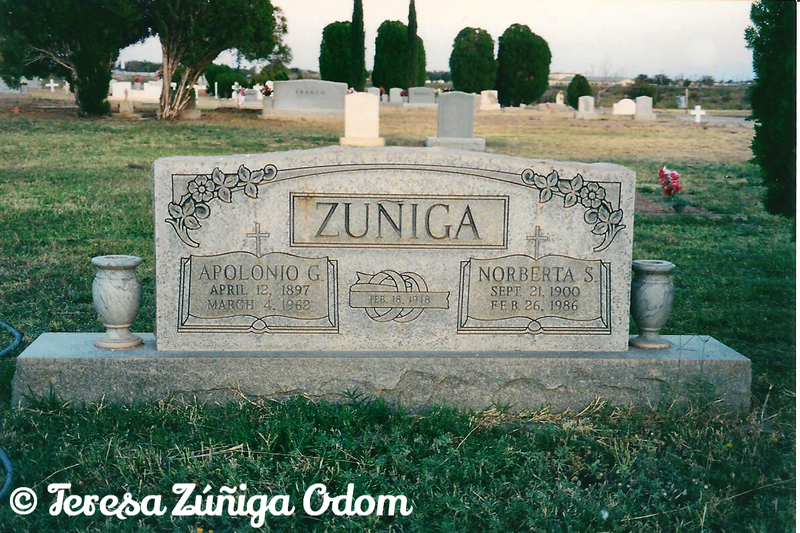 Turns out, our family is in the older cemetery and as we drove by we saw the Zuniga headstone. Now let me explain something…we had been walking around the newer cemetery – all green grass and open – and could not find our grandparents. 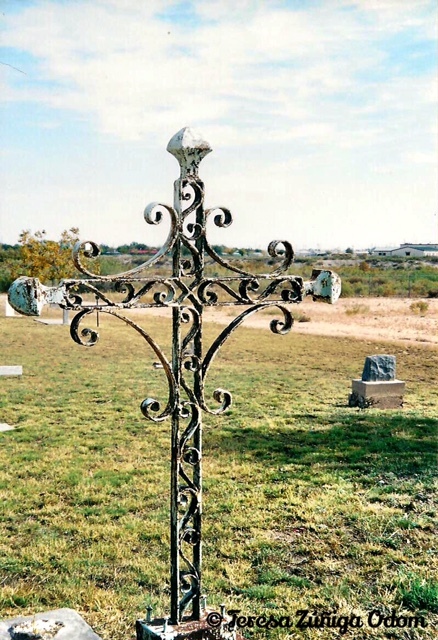 But when we got to the older cemetery – brown dirt and no grass – it was chain-locked! Really??? We couldn’t believe it. But, I would not be deterred! I told Kanista and Lisa I had come too far not to get in…so…I broke in! Actually…I just pushed the gates and they opened. 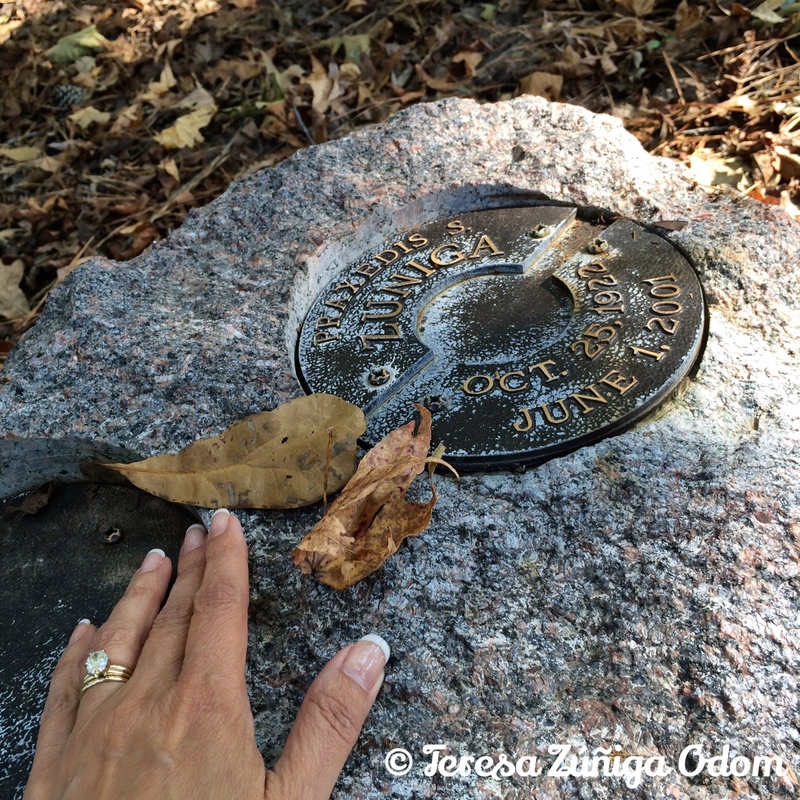 So, we took a little time and walked around, explored and found some of our family headstones. Cutting a rug with Lisa at Syba’s Halloween/Birthday party! Not sure if this was before or AFTER the jello shooters! After freshening up at the hotel, we headed over to Syba’s birthday/Halloween party and met a few more cousins – Danny and Johnny, grandson’s of Maria Fernandez – Maria was my grandfather’s sister. We had a ball at the party – trying jello shooters, dancing, and laughing about being called “guera” by some of the guests. Guera is slang for a white girl or light-haired girl, which didn’t really seem to fit me or Kanista at ALL! At any rate, we ended day three of our trip exhausted but exhilarated by the people who seemed to be put in our path on our journey. Kanista, Lisa and I all agreed our fathers seemed to have a hand in what was happening to us in Carlsbad. 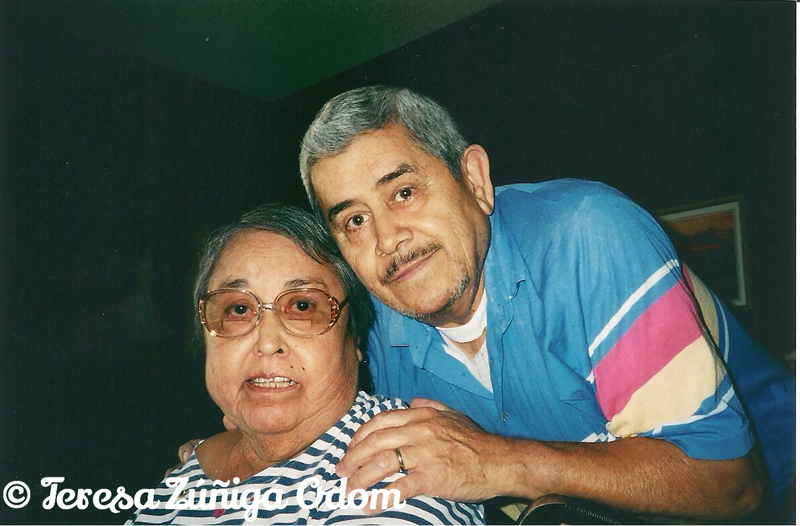 This entry was posted in Carlsbad, Cousins, Familia, New Mexico, Photo Vault, Uncategorized and tagged Aunt Yoya, Carlsbad, Cemetery, Cousins, El Patio, New Mexico, Pilgrimage, Uncle Mando on October 27, 2014 by Southern Señora. 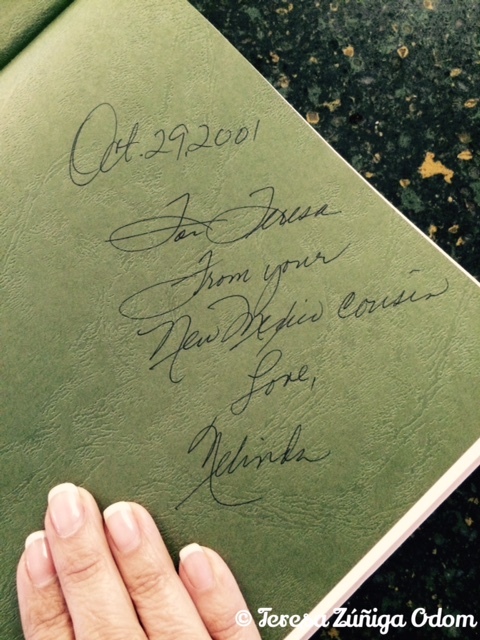 This will be a three-part story about my 2001 visit to New Mexico. 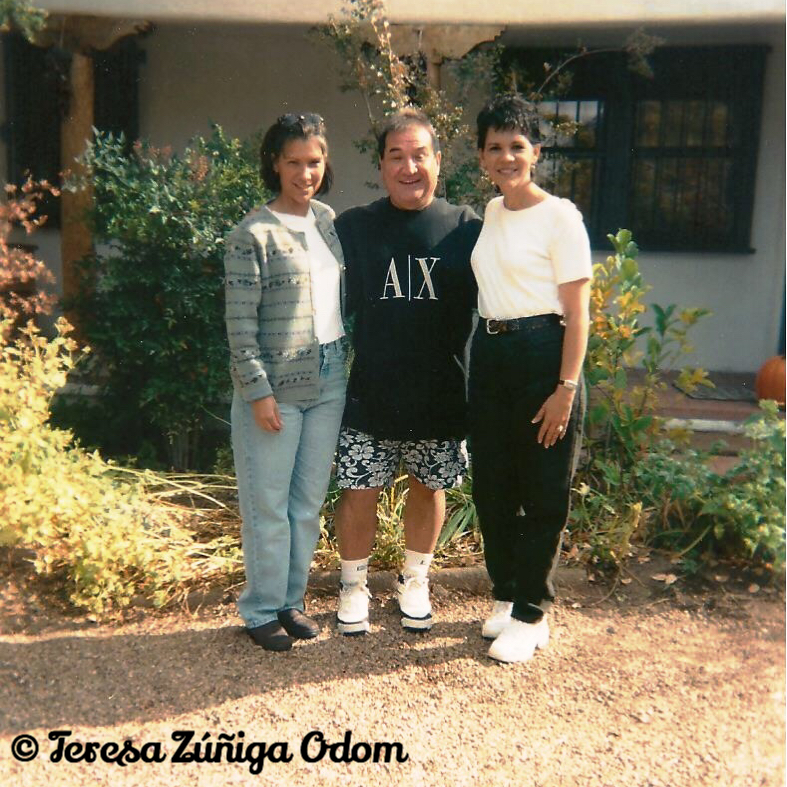 My dad, Praxedis Sotelo Zuniga, died on June 1, 2001. He was 79 years old. 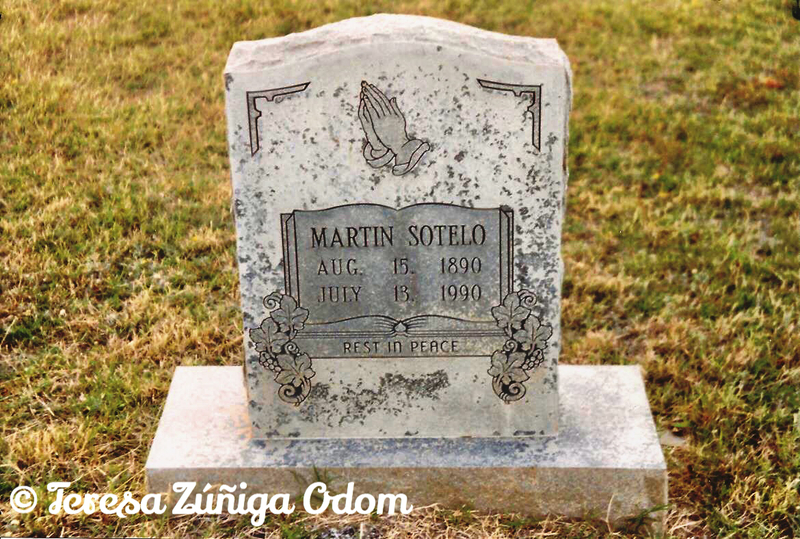 An accomplished man, he was a husband, father, friend, army pilot, civil engineer, and spoke several languages, with Spanish being his first. We regrouped and decided to fly out on October 25th – our dad’s birthday. Meanwhile, our youngest first cousin on the Zuniga side, Lisa Ramirez – who lives in Colorado, contacted me and asked if she could come along. Kanista and I were ecstatic! Lisa grew up in Carlsbad and it was the icing on our dad’s birthday cake to have her join us in this journey. She is the youngest daughter of my dad’s younger brother – Felix and his wife Manuela (Aunt Mela). 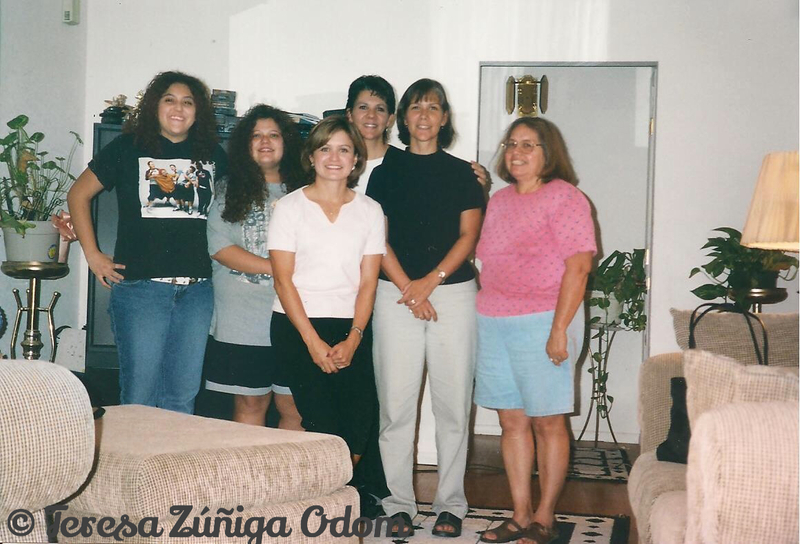 Another plus is that we flew into Albuquerque where Lisa’s oldest sister, Nelinda (nicknamed Danda) lives and we were invited to stay with her before our road trip to Carlsbad! I arrived first. While waiting for Kanista, I started writing in my travel journal. It was good to have a little bit of time before she got there to reflect and collect my thoughts. Dad has suffered a series of stokes in his later years and shortly before he passed, he was unable to speak. There were so many things I wanted to ask him too and I missed my chance to hear them in his own words, with his own voice. This trip was pulling me and I know Dad was behind it, setting the stage for me and Kanista. Kanista arrived and we headed to the rental car place and got the last car! 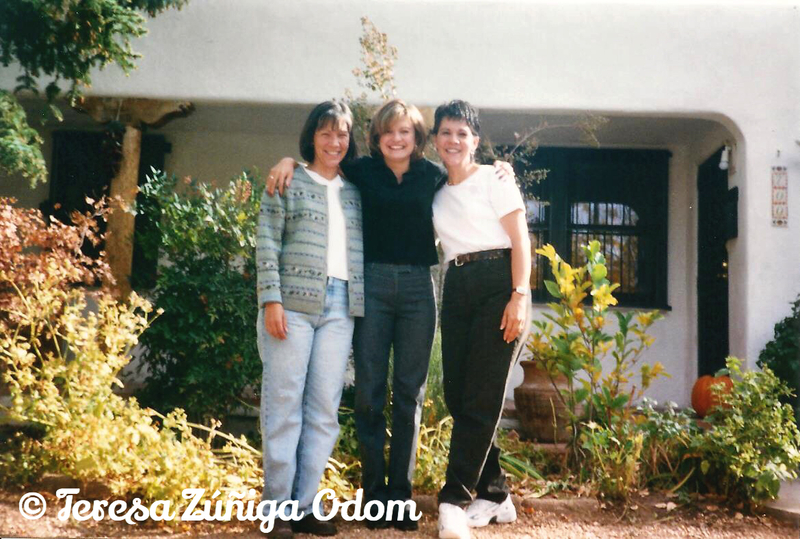 We drove through Albuquerque and decided to find our cousin Cecilia and visit with her before heading to Danda’s house where Cecilia joined us later. Cecilia is the daughter of my dad’s baby sister, Gloria, who was still living in Carlsbad at the time with her husband, Armando (Uncle Mando). The outside of my cousin Danda’s house. I love her style! Arriving at Danda’s we were excited to meet Bobby Fernandez, a cousin on our grandfather’s side (Tata Polo)! He and Danda seemed more like brother and sister as we watched their exchanges throughout that night. 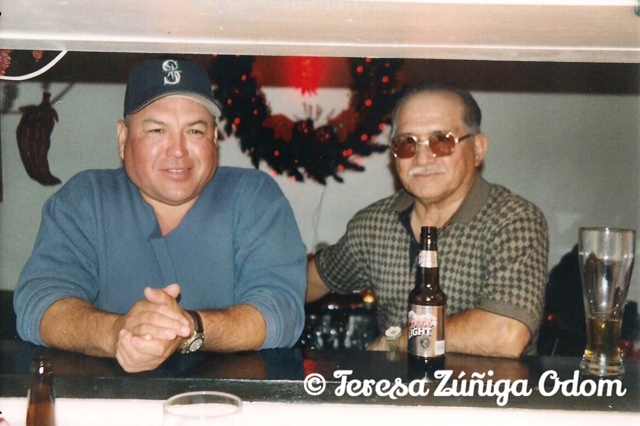 We both loved Bobby from the start He was in charge of making our drinks that night – micheladas! And tequila, of course! 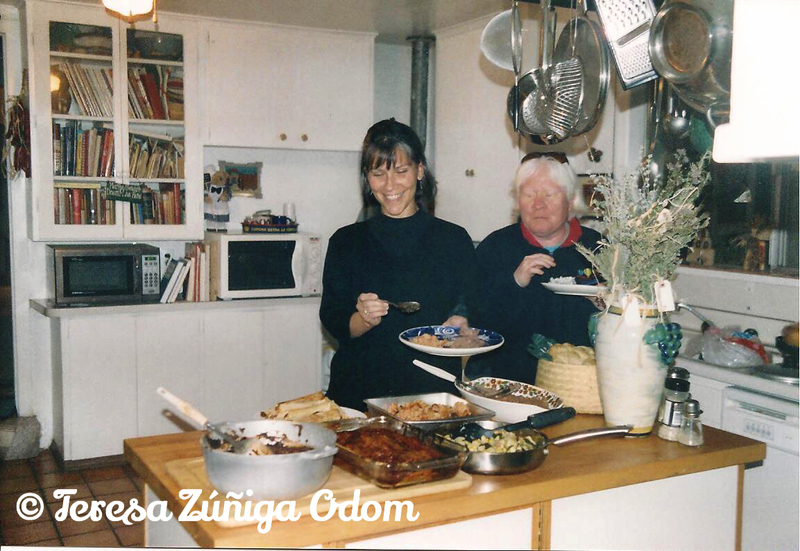 When Lisa arrived, we settled into a fabulous meal that Danda has prepared for us…carne asado, tortillas, enchiladas…goodness! The food from my cousin is always incredible and you find yourself going back for seconds and thirds! No shame here! 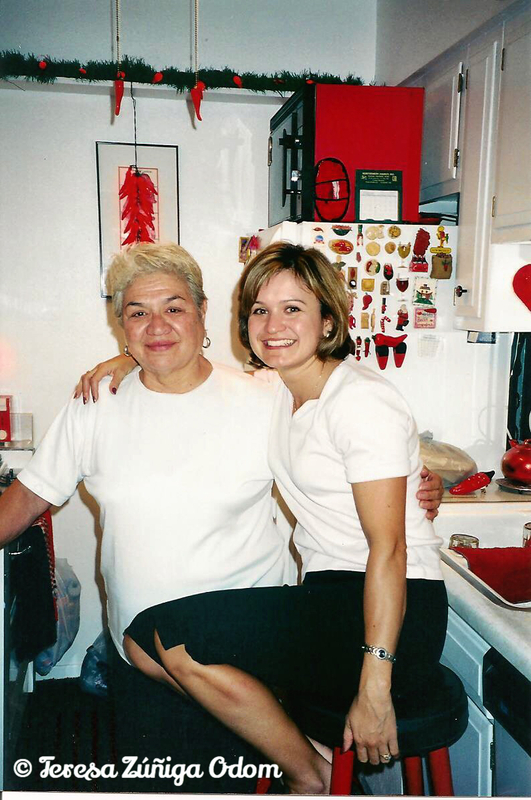 I remember the night as being full of laughter…we laughed so hard at Danda’s stories and listening to her explain all the family nicknames like Googs, Boogie, Lala, etc. (I’ll have to share all that in a later post.) When we finally went to bed we realized it was morning – 2:30 a.m.
Kanista and cousin Cecilia fill their plates at my cousin Danda’s house…we couldn’t get enough! This first day of our trip was incredible. It was the best way I can think of to celebrate my dad’s birthday – with family – in New Mexico and sharing stories about our fathers – Felix and Praxedis . So many similarities. So much connection. Our bellies were full that night and so were our hearts. 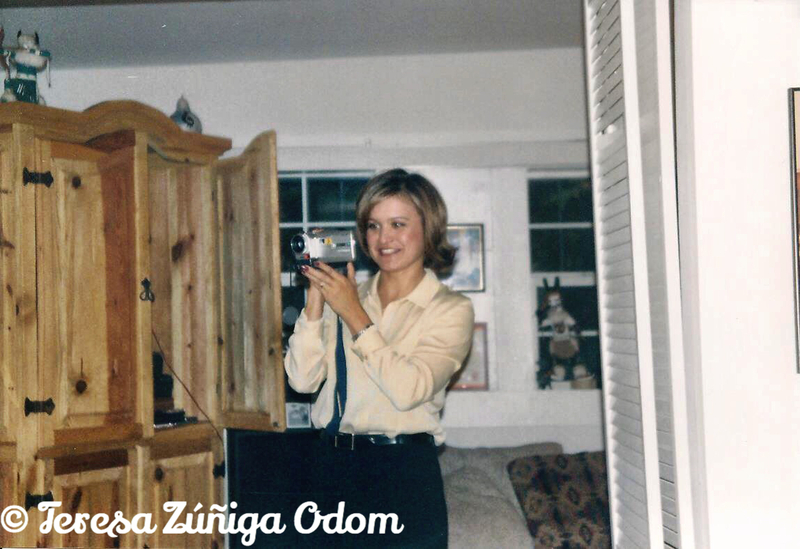 This entry was posted in Albuquerque, Carlsbad, Cousins, Familia, New Mexico, Photo Vault and tagged 9/11, Birthday, Cousins, Family, Father, Mexican Food, New Mexico, Praxedis Sotelo Zuniga on October 25, 2014 by Southern Señora. After scoring the “Hey Lady” Talavera pottery vase, (see previous post), one of my biggest Talavera pottery scores came from Home Goods, right next door to my local TJ Maxx. I went into Home Goods one day with a specific purchase in mind and it wasn’t Talavera pottery! The first thing that I do in any store is walk down the clearance aisles. On this particular day, I headed directly to the clearance aisle and I spotted the most glorious sight! TALAVERA!!! Lots and LOTS of Talavera! And it was on CLEARANCE! La Maceta Talavera pottery that I found on the clearance aisle at Home Goods for $16 and $12 respectively! Unlike my first experience at TJ Maxx, when I didn’t grab a shopping cart for the “Hey Lady” vase, this time I walked swiftly and with great purpose to the front of the store and grabbed one. A plus to this visit was that there were hardly any people in the store at that moment. So, there I was all by myself, with a cart in hand and a selection of Talavera Mexican pottery so gorgeous that I didn’t know where to start. I began looking over the pieces and carefully but eagerly selecting the ones I wanted. I placed them ever to gently in my cart. So many assorted colors and designs! YES! I felt like I was in Talavera heaven! By now I had about 5 vases of different designs and styles in my basket. I was trying to decide on a rather brilliant colored vase I was holding when I decided to put it back on the shelf and give it some thought. At that same moment, a woman rounded the corner and began taking a great interest in what I was doing and what I had in my basket. 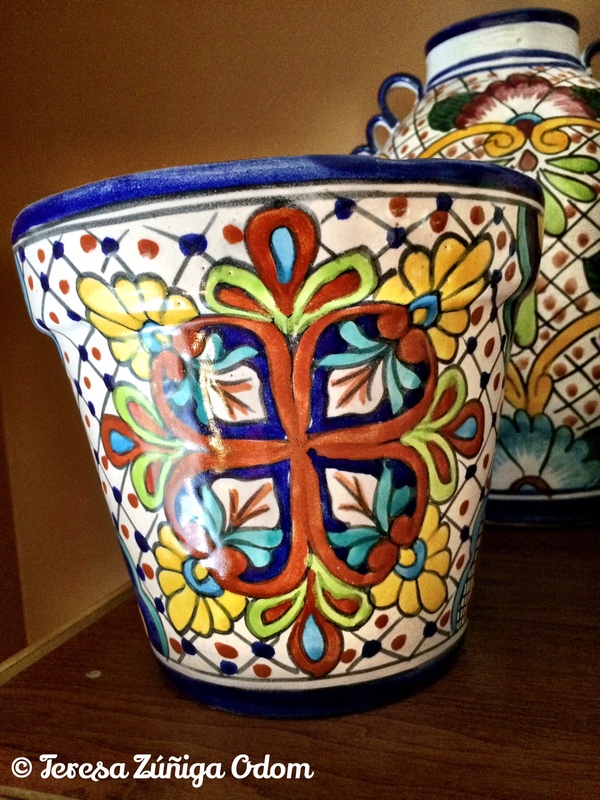 Talavera pottery finds from Home Goods. Women: “Ooooohhhh!….what are those?” Me: “They’re Mexican pottery pieces.” Women: “Ooooohhhh! They’re pretty!” (as she heads straight for the piece I was trying to decide on but stupidly put back on the shelf.) Me: “Yes they are!” (growing anxious and resisting the urge to grab the vase back off the shelf!) Woman: “So what would you do with one like this?” (…as she picks up the vase that I NOW WANT and begins admiring it.) Me: “Well, with that one I would probably either put a plant in it or use it in my bathroom for hand towels or… (I rattled on with other amazing uses for Talavera pottery while my brain is yelling for me to SHUT UP!) Woman: “Oh okay!” (as she places the gorgeous piece in her basket and I continue to talk – while simultaneously kicking myself for being so incredibly convincing about the uses of Talavera pottery!!!) I still wound up with some incredible pieces that day that now grace the wall unit of my family room. Small flower pot vase from Alba Talavera, Guanajuato, MX. Found on the clearance aisle at Home Goods! TJ Maxx and Home Goods still get Talavera pottery pieces on occasion, but now I approach them cautiously and act disinterested so I don’t attract attention! On a side note, my “Hey Lady” vase cost me $70. On this day at Home Goods, I bought 6 Talavera vases from the clearance aisle for about the same price. I definitely hit the jackpot that day! 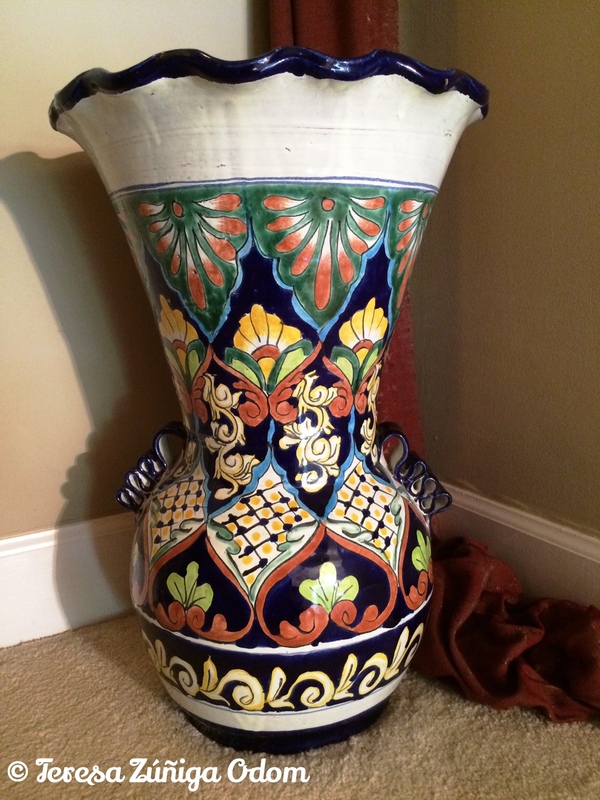 Tall Talavera Vase – purchased on sale at Home Goods. 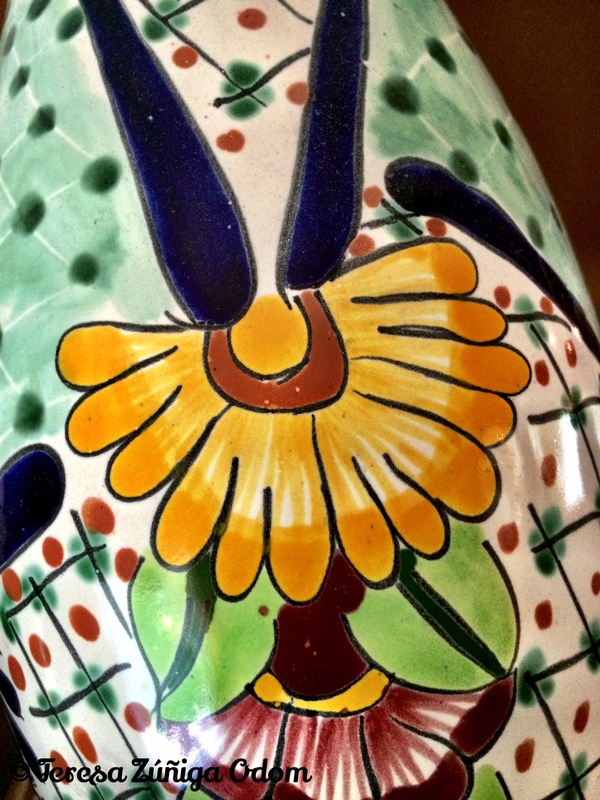 A closer look at the details of one of the Talavera vases. 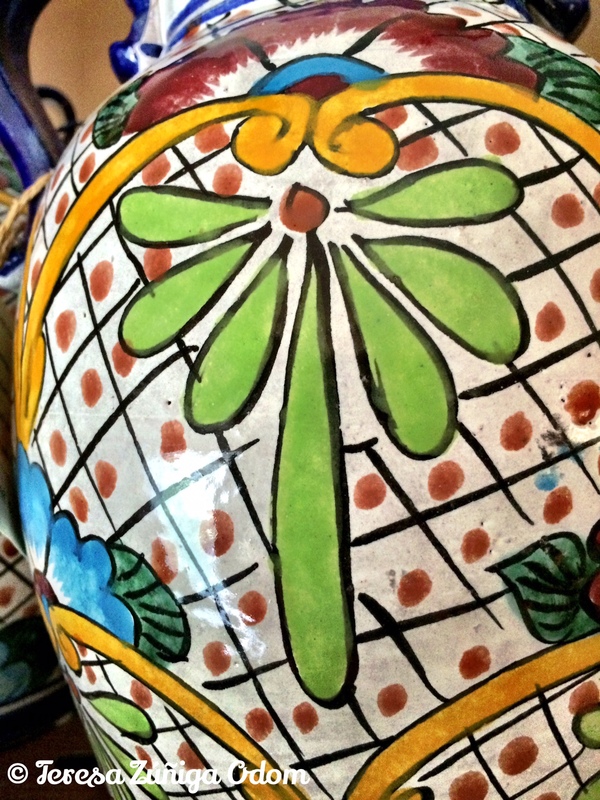 This entry was posted in Mexican Pottery, Talavera and tagged Alba Talavera, Clearance, Home Goods, La Maceta Talavera, Mexican, Mexican Pottery, Talavera on October 21, 2014 by Southern Señora. 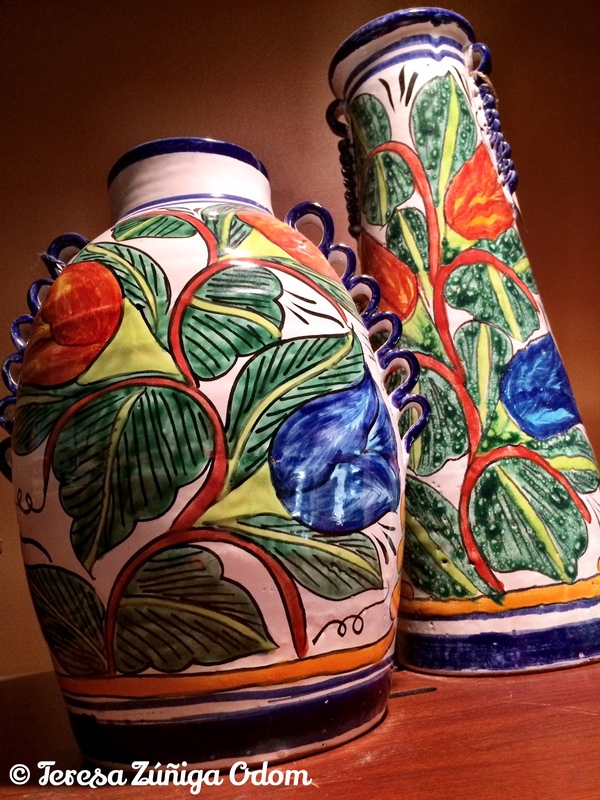 I LOVE TALAVERA POTTERY! 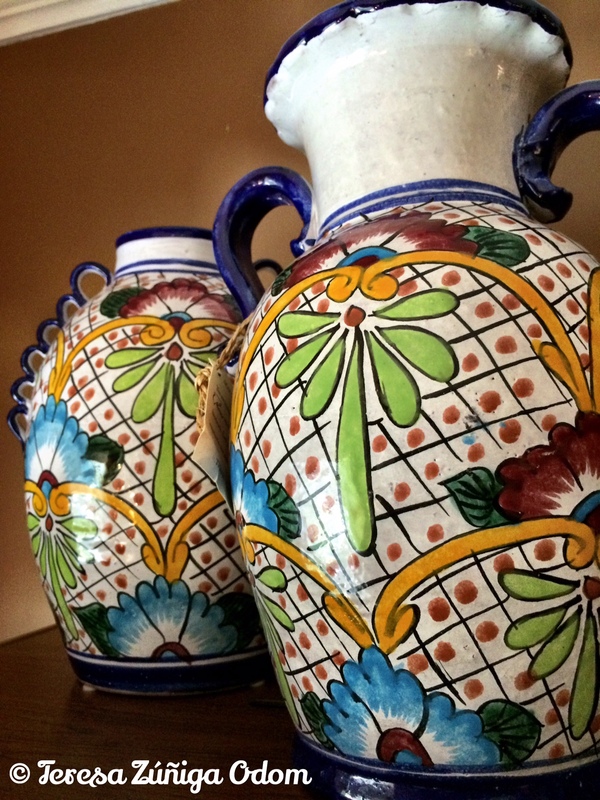 I’ve been collecting this style of pottery for years and I have a story about pretty much every piece I have ever purchased…but this is the story of my first Talavera pottery purchase. It is a rather large vase that sits on the stairs of my foyer. My kids call it the “Hey Lady” vase and this is “her” story. 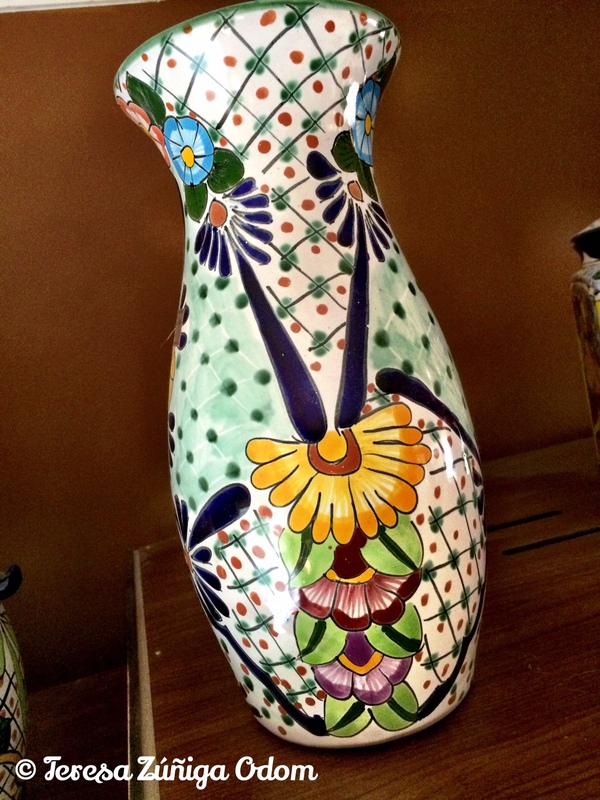 My “Hey Lady” Talavera Pottery Vase from TJ Maxx. One day many years ago, I went to our local TJ Maxx armed with a $50 gift card and determined to find some sort of treasure. After browsing the home section for a little while, there it was – tucked away in a corner, just waiting for me to find it. I couldn’t believe my eyes! It was as though light from the heavens began shining down on this beautiful vase, lighting the way for me. This vase knew it would soon be making it’s home in MY home! I approached it, turned it around and admired the beautiful colors and then thought to myself – this is a BIG vase! Should I grab a buggy and come back? Would I drop it on the way to the register? Would someone else grab it while I went to grab a buggy? Do I take that chance? You know how it goes…the moment you show interest in something at a store, suddenly everyone around you wants what you have! And of course, this is exactly what happened. I noticed people around me watching, just waiting for me to walk away so they could scoop my vase up. So right then and there, I picked up this huge vase, cradled it in my arms like a baby and started walking carefully through the store to the registers. By now I was laughing pretty hard, as I got into my car to head home and find the perfect spot for my much coveted vase. I couldn’t wait to share the story with my family and after much more laughter, the legend of the Hey Lady vase was born! 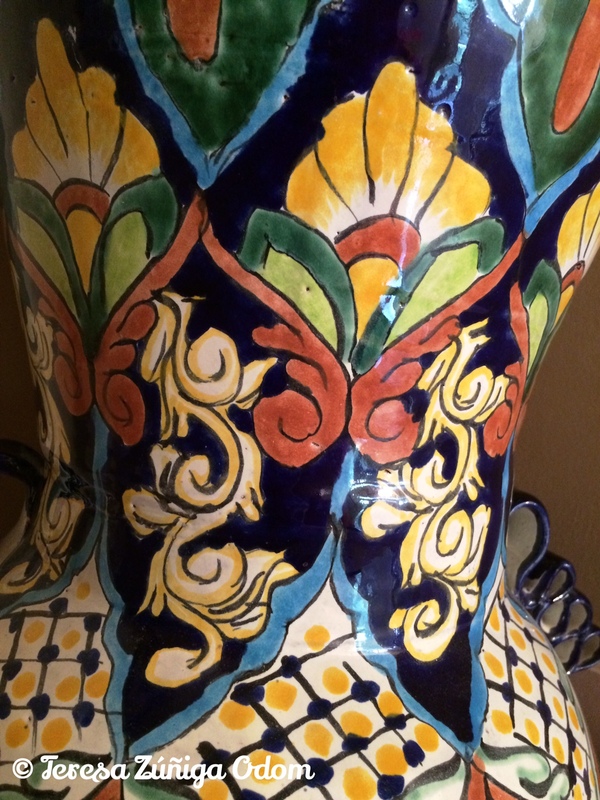 This entry was posted in Mexican Pottery, Talavera and tagged Collections, Hey Lady Vase, Mexican Pottery, Talavera, TJ Maxx on October 19, 2014 by Southern Señora. Fiesta 2014 is now a great memory for the board and planning committee…it was an incredible day! Last Saturday, September 27th, we enjoyed great weather, huge attendance, many new vendors and participants, and reconnected with so many long time amigos! We reconfigured our set-up in Linn Park and it really made a difference in the attendee traffic. Everywhere I looked, there were people and families enjoying the event, eating delicious food and sitting on the beautiful green grass. 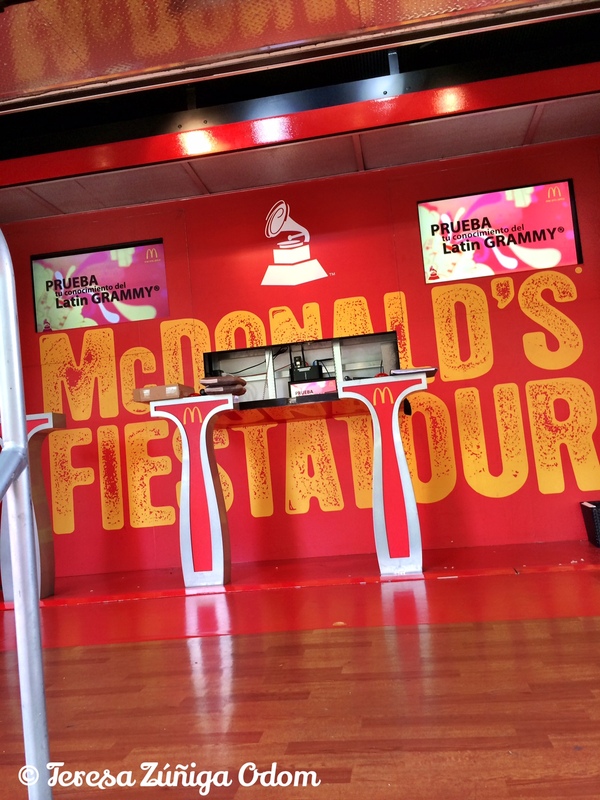 Our title sponsor, McDonalds, brought an incredible exhibit – The Fiesta Tour – a 53-foot long traveling mobile unit that pays tribute to Latin GRAMMY winners – to Birmingham for us to enjoy. Every time I went by the exhibit, there were crowds – such a beautiful sight! The Santiago brothers, Santiago and Russ, have been wonderful partners to Fiesta this year and we are so grateful for their presence! The McDonald’s Fiesta Tour entrance. What an incredible exhibit! 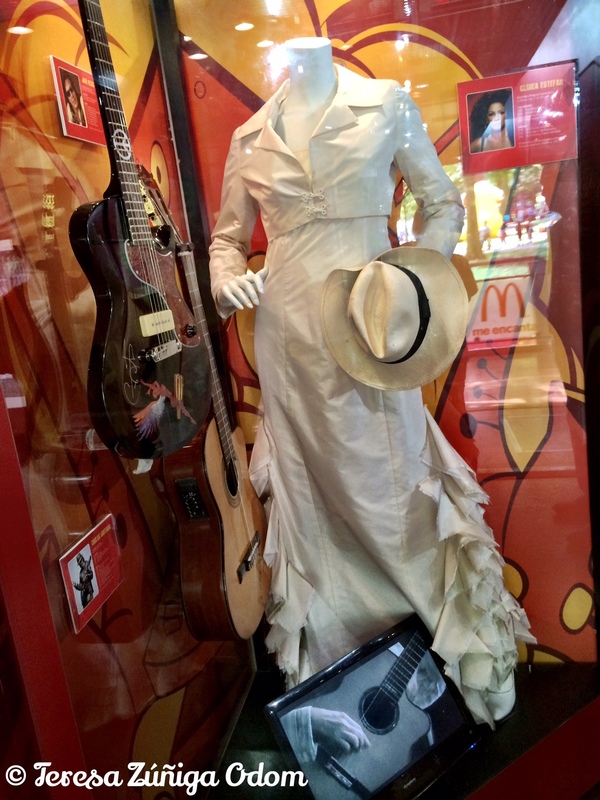 A dress worn by Gloria Estefan and a guitar owned by Carlos Santata – just a few of the items in the McDonald’s Fiesta Tour on display. 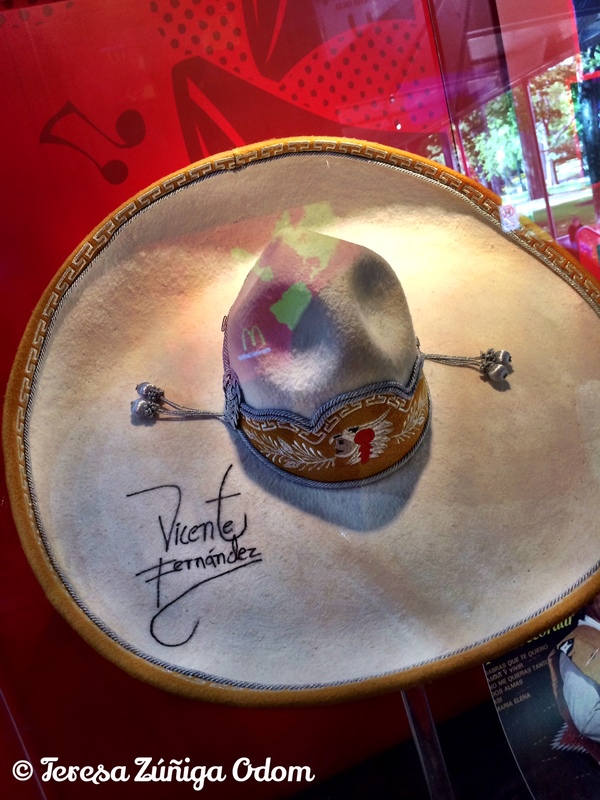 Sombrero belonging to Mexican artist – Vicente Fernandez – in the McDonald’s Fiesta Tour. 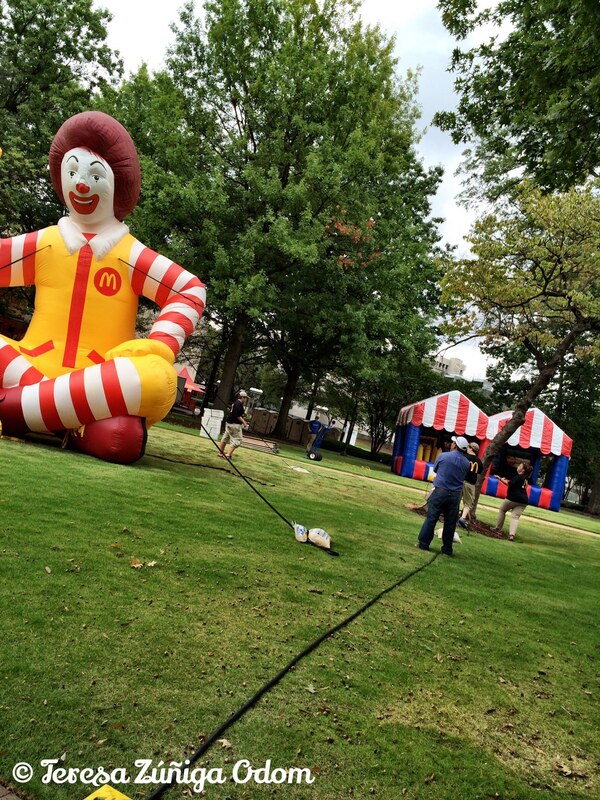 Ronald McDonald gets anchored in Linn Park, in the Family Village. I downloaded more than one thousand photos last Sunday afternoon. 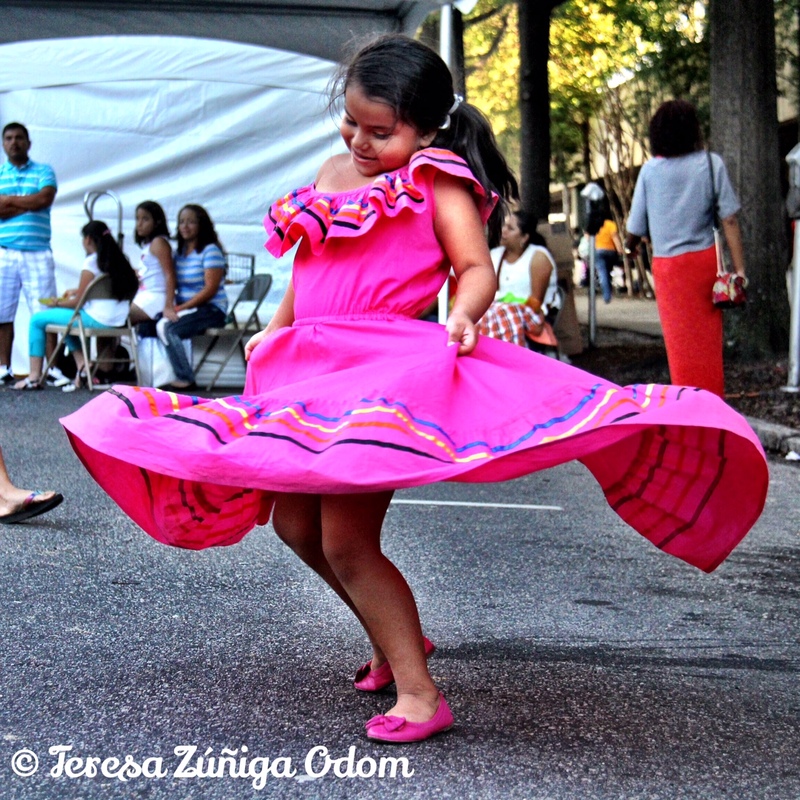 It always amazes me how many photos I take at Fiesta each year. And yet, there are always shots I miss and think about later. Oh! And this doesn’t include the photos I take with my iPhone! 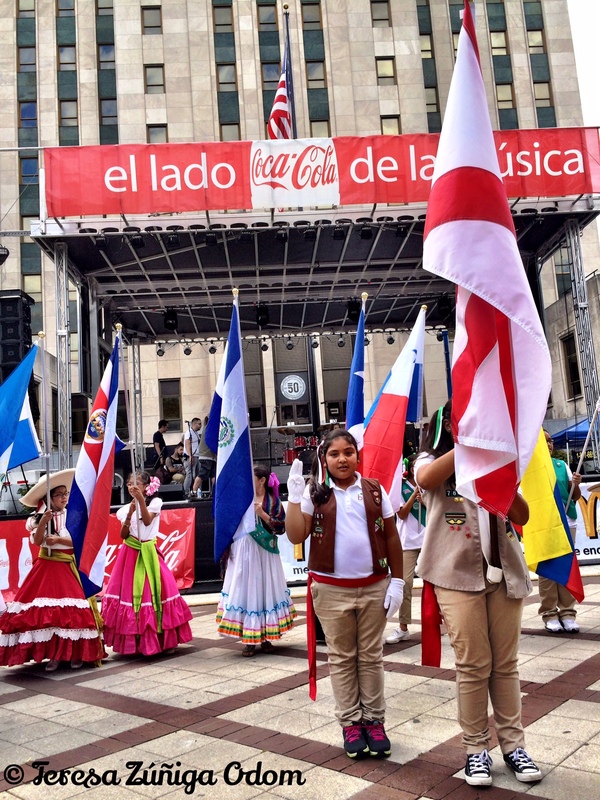 One of my favorite elements this year was having the Hispanic Girl Scouts of North Central Alabama participate with the presentation of colors, pledge of allegiance, Girl Scout promise (in English and Spanish), and finally parade around the park with the flags of the Latin countries while dressed in native costumes! It was absolutely a BEAUTIFUL sight! In fact, I do believe (aside from the music acts), that the Girl Scouts were the most photographed group of the day! The magnificent Marisela Mendez, the Hispanic Initiative Manager for GSNCA, worked for many weeks to pull the girls and their families together for Fiesta. This Dominican woman is a “powerhouse” and the community is lucky to have her working for Hispanic girls in our region. 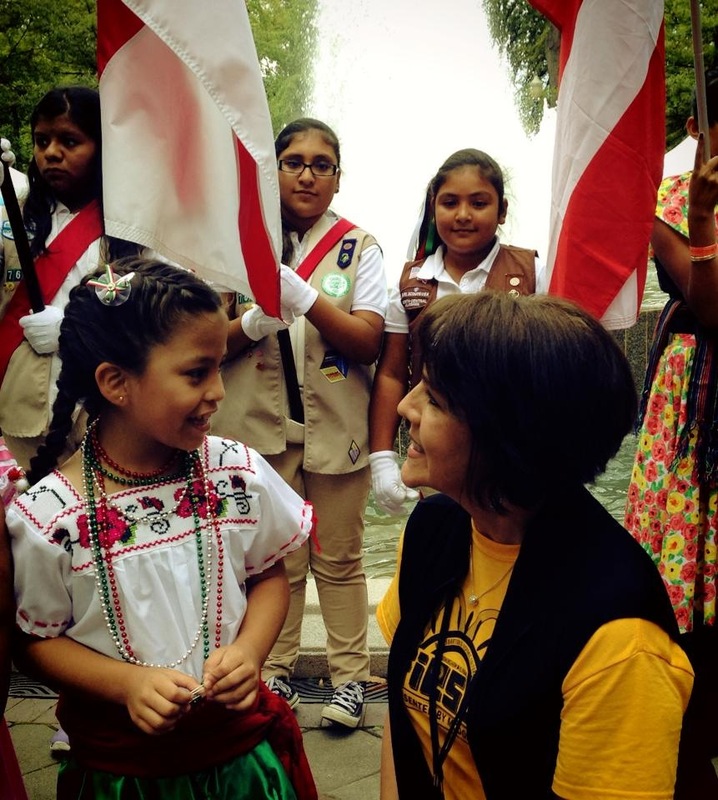 Her heart is all about connecting these little girls with Girl Scouts and she will do everything possible to ensure they can have the Girl Scout experience in their lives. 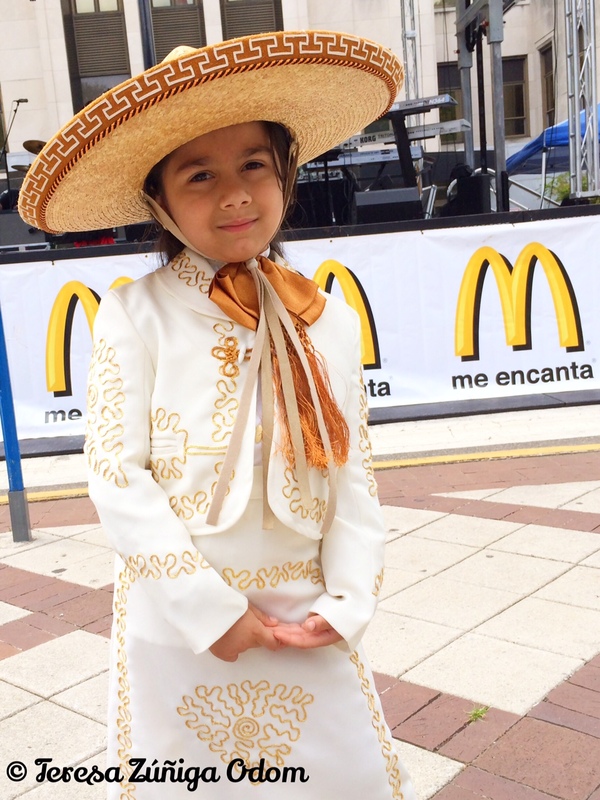 This precious little one lead the Girl Scouts around the park in the parade of flags, dressed in a beautiful white mariachi outfit. The Girl Scouts pose in front of their booth at Fiesta. 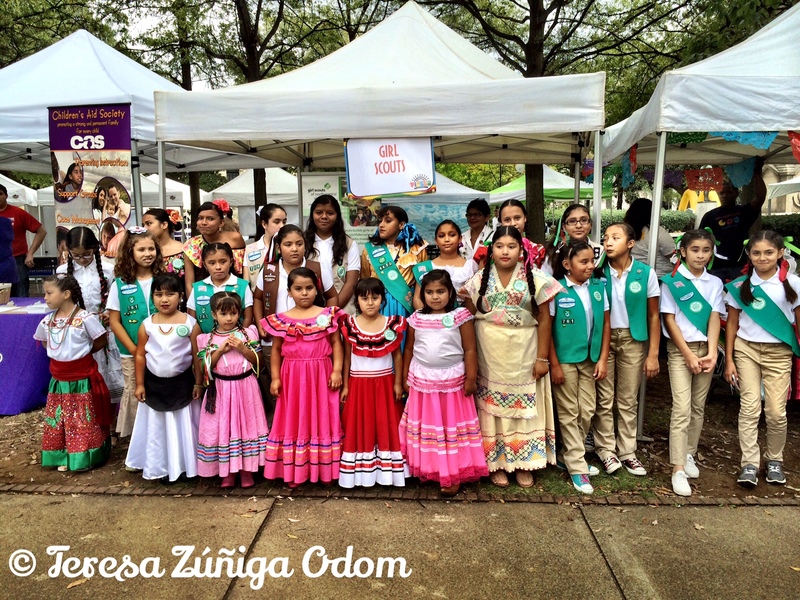 The Hispanic Girl Scouts of North Central Alabama during the flag ceremony – presentation of colors. 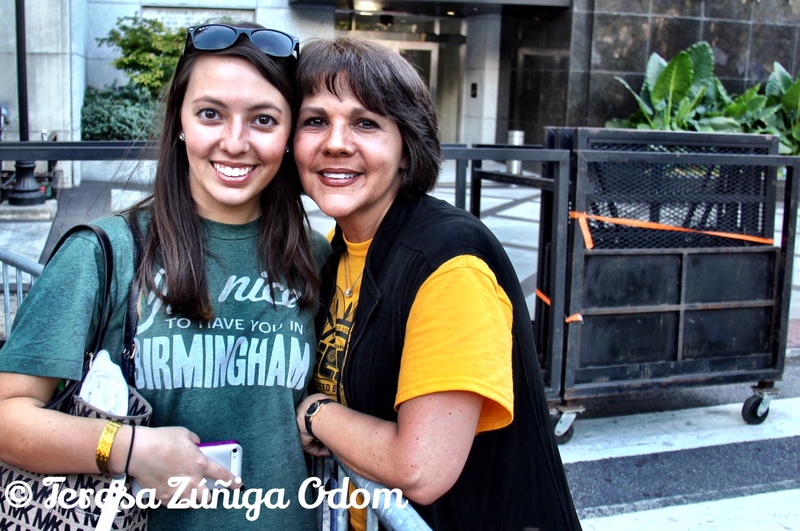 I’ve pulled a few of my favorite photos from Fiesta to share on the blog. If you were at Fiesta and took some photos, please post them on the Fiesta facebook page! We would love to see what you captured!!! This little one kept twirling to the music next to the main stage. Such joy! This little girl saw me taking photos of the girl in the pink and decided she wanted to twirl and have her picture taken too! Sugar Skull faces at Fiesta! These young ladies were popular – everyone wanted to have their pictures taken with them! Got to hang out with my daughter, Anna Marie, for part of the day. She is always so helpful when I’m making my photography rounds in the park. Dancers on the stage…they certainly drew a crowd! Running into Ricardo and Aimee Aparicio was the best!Reconnecting with long time friends is one of the joys of Fiesta for me. Ricardo was there when Fiesta was started. 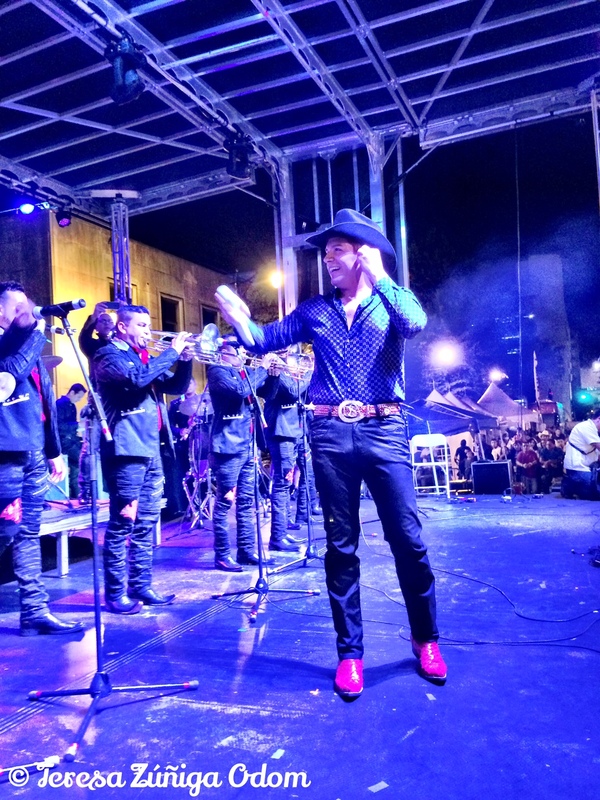 On stage with El Dasa! Great energy during his entire performance! 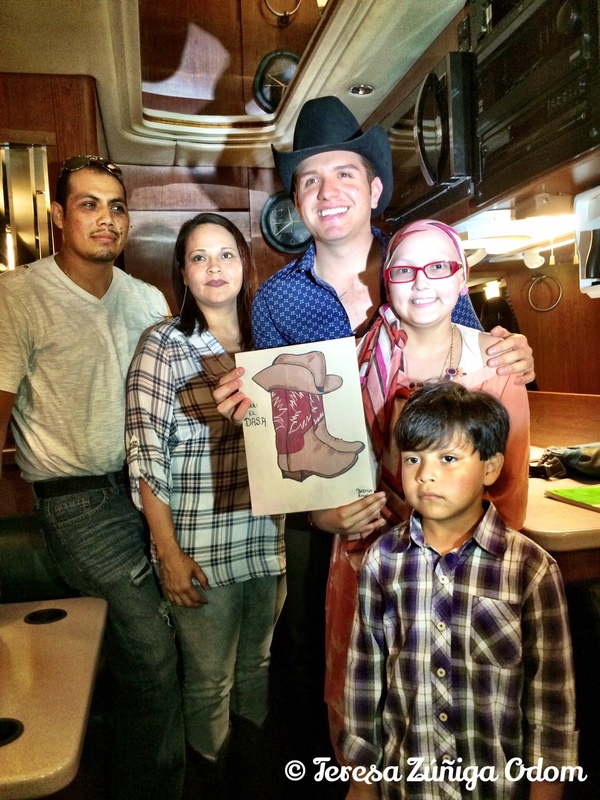 El Dasa’s surprise meet and greet with a young girl battling cancer – I don’t think there was a dry eye in the trailer when this happened. It’s always fun to run into Clark Scott and Larry Gay at Fiesta. They take some amazing photos each year! 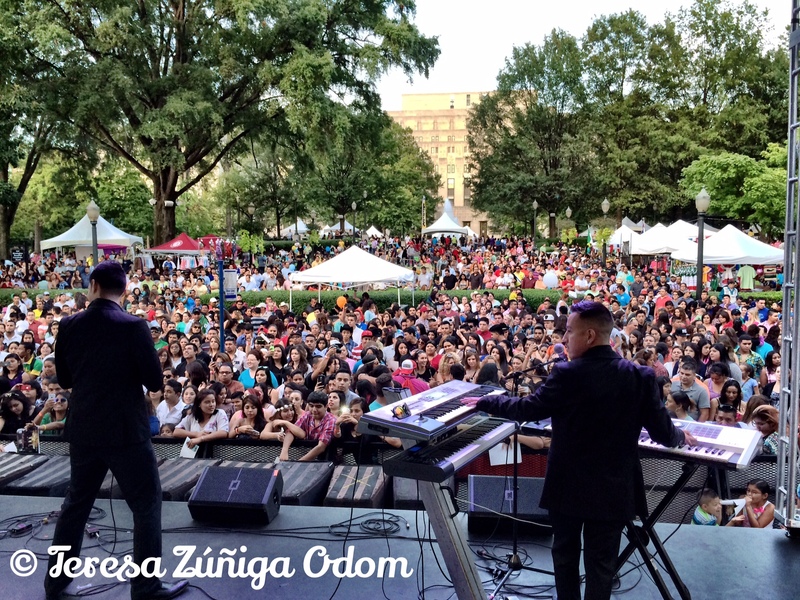 Crowds were massive this year at Fiesta 2014! 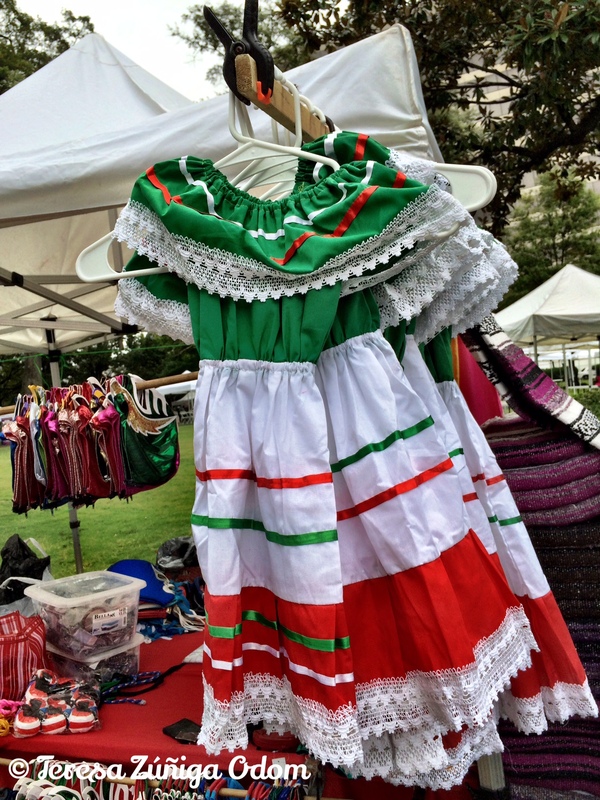 Traditional Mexican dresses for sale at Fiesta. 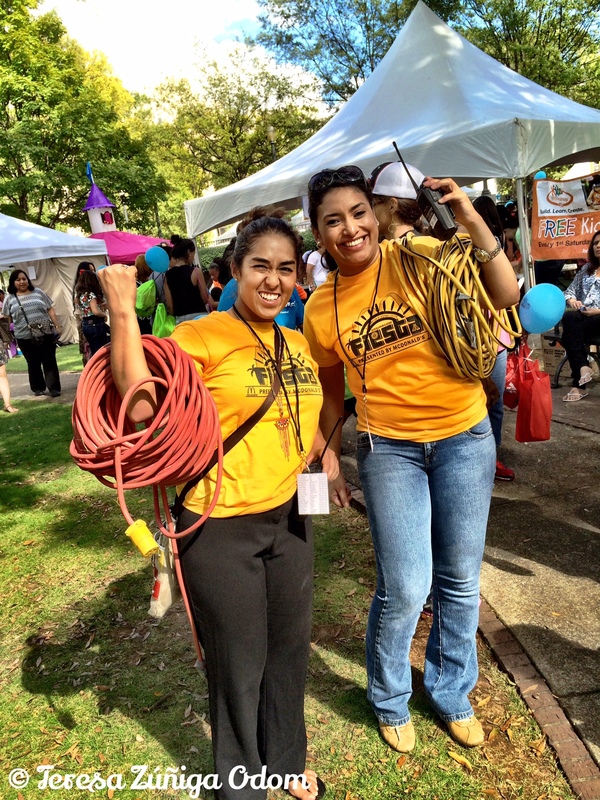 Two of the hardest working women at Fiesta this year – board members Vannessa Vargas and Cristina Almanza! They absolutely ROCK! This entry was posted in Fiesta, Girl Scouts, Hispanic Heritage Month, McDonalds and tagged Amigos, Culture, Dance, Festival, Fiesta, Fiesta Tour, Food, Friends, Girl Scouts, Hispanic, Hispanic Heritage Month, Latin Artists, Sugar Skulls on October 5, 2014 by Southern Señora.